I have a small collection of interesting (to me!) 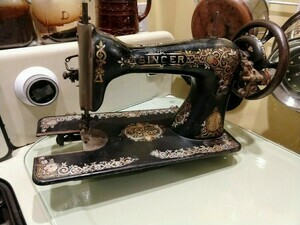 sewing machines. I didn’t really intend to start collecting, but once I had a few, and told people about them, I was offered more. And eventually, as I learned more, I started buying a one here or there. But I figure I’m just the caretaker of these things for a while. The machines are listed on this page in “acquisition” order. There’s also a pictorial index ordered by age which might be easier on the eyes. And if you prefer no ordering at all (! ), there’s a random-order index of every single picture. 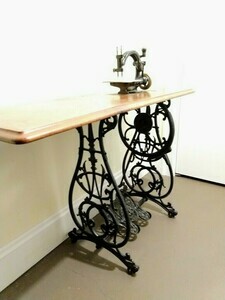 Most of my machines work, and sew well. The goal is that they should all do that. I try to use them all occasionally, or, in the case of the very old ones, at least once. 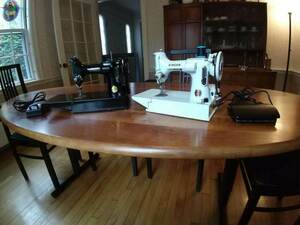 I sew a bit, but not well, and not nearly enough to justify more than one machine in the house. But I enjoy the cleverness and quality that went into their invention and design. 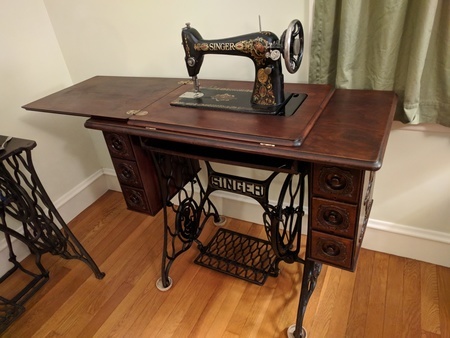 Early sewing machines live at an interesting intersection of history, aesthetics, precision engineering, and domesticity, all of which I find compelling. 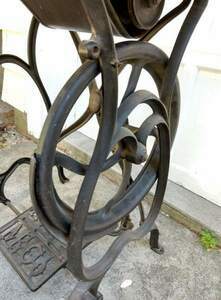 I think of them as kinetic sculpture, or at least kinetic industrial art. 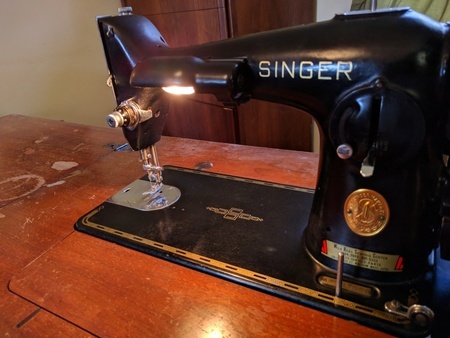 Statistics: As of April 1st 2019 I own 24 complete sewing machines. (This both surprises and pleases me!) They range in age from 43 to 160 years old (14 of them are over 100). 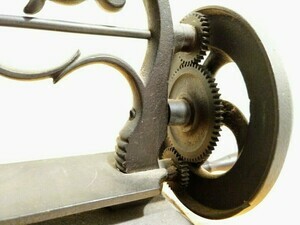 Seven are treadle machines, six are hand cranks, nine are electric (representing belt, gear, friction, and direct drive). 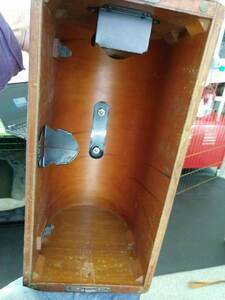 One of the electrics is in a floor cabinet, the rest are portable. Two machines don’t have a power source – one is broken in a couple of ways anyway. 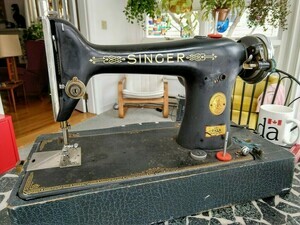 Maybe it will sew someday, or maybe not. The other came to me as just the head. 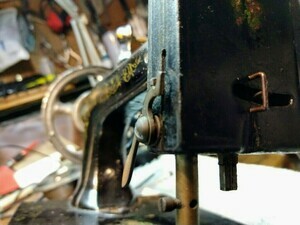 The other 21 can all sew (or will, soon). 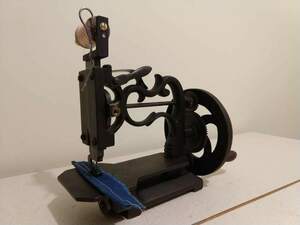 Oh, and by way of thanks, and to give credit: the folks on the Victorian Sweatshop forum have been very helpful, as have the members of the TreadleOn mailing list. 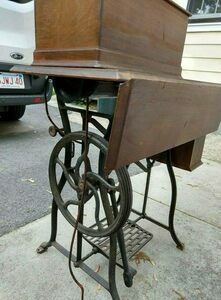 If you’re interested in old machines, those are the places to go! The pictures are all clickable for larger versions. And if you want to skip the text, and just look at pictures, click on any picture and then use the arrows (or click on the larger image itself) to navigate. 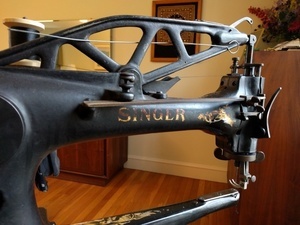 At the turn of the 20th century, Singer was the largest furniture manufacturer in the world. This interesting article talks about that side of their business. 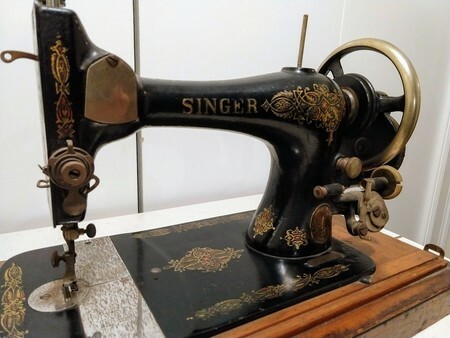 The Smithsonian has copies of Singer product catalogs from 1907 and 1908, which contain some amazing machines – like with 12 needles and bobbins, or with 6 foot wide beds. 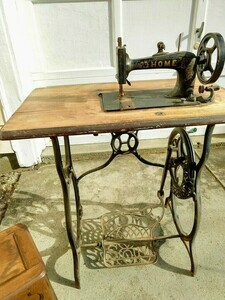 It lists my 29-4 as costing $40, or just $37 without the treadle base. 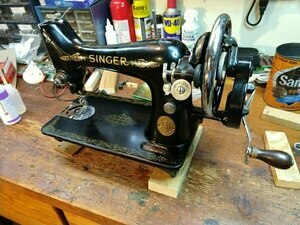 I purchased my Singer 29-4 (s/n G4763444) in June of 1998 from the owner of The Village Cobbler shoe repair shop in Lexington, MA. It was a spare machine, stored at home in his cellar. 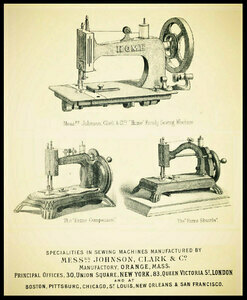 These machines were built between 1896 and 1922. 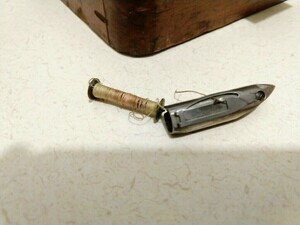 Mine is from roughly 1916. 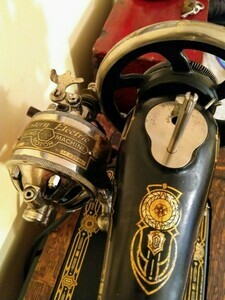 It’s an interesting machine, and not only for its air of steampunk authority. 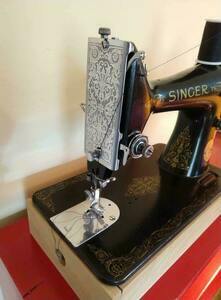 The arm containing the bobbin is designed to be slender enough to fit into the toe of a boot. 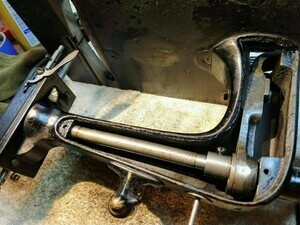 The feed mechanism isn’t implemented with the usual feed dogs, which would rise from under the presser foot to pull the material forward. 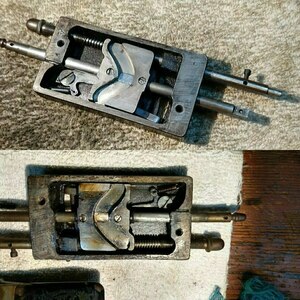 Rather, the presser foot lifts and “walks”, dragging the material underneath on its backward stroke. 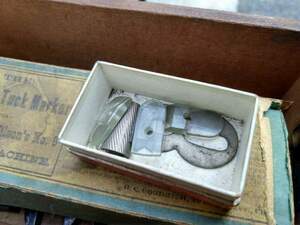 In addition, the presser foot can be rotated 360 degrees, to allow sewing in any direction without turning the material or object being sewn. 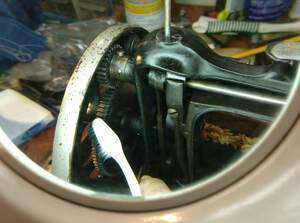 The thread runs down through a hole in the center of the needle bar, so it doesn’t get twisted up when the presser foot rotates. 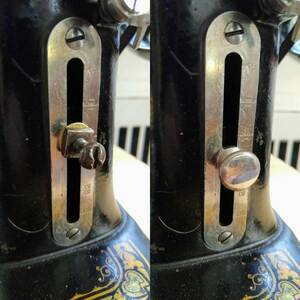 The only significant repair I’ve made was to the bobbin “case”: a needle tip broke off when I ham-fistedly tried sewing something much too heavy, and the tip was dragged down beside the bobbin where it jammed and caused score marks in in the cast iron hole surrounding the bobbin. 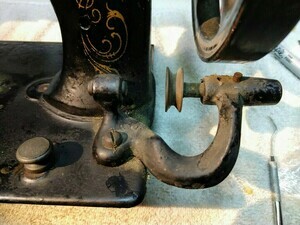 This scoring snagged the thread as it passed under the bobbin, and the machine would no longer sew. The fix involved emery cloth, and JB Weld, and more emery cloth, in order to smooth out the walls of that hole. 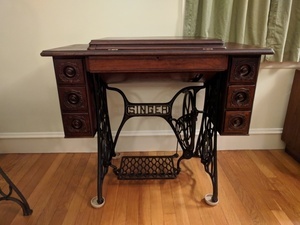 Someday, I’d like to build a replica of the table accessory that Singer used to make. Someone asked me for the dimensions of my 29-4’s drawer, because they wanted to reproduce it. Those measurements are here. 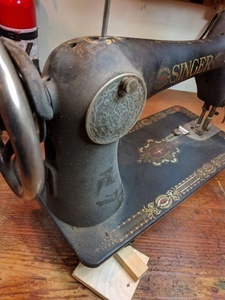 This portable Fashion Mate 237 (s/n ME167737) was purchased by my mother, Connie Fox, in 1969 or 1970, replacing the much older black Singer she owned before. (I wish I knew what model it was that she replaced!) It came to me in 2003. The ME prefix on the serial number shows this was made in Monza, Italy – I believe all 237s were made there between 1968 and 1972. The 237 came originally in a portable carrying case, which I discarded, sadly and stupidly, when I got the current cheap cabinet. Its potential future value didn’t occur to me at the time. I don’t recall ever needing to repair the 237, in my youth, or recently. 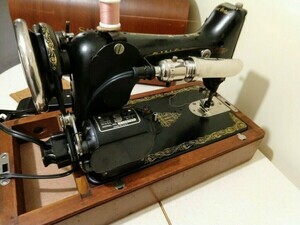 I recently remembered that I almost started collecting truly “old” machines many years ago (2011), but for some reason either I didn’t have the time, or the machine that I happened on didn’t quite press the right buttons, or who knows what? 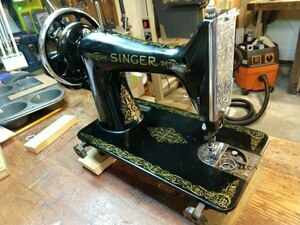 Anyway, the story was that friends of mine had picked a lovely Standard Rotary off the curb, with an eye toward refurbing it. 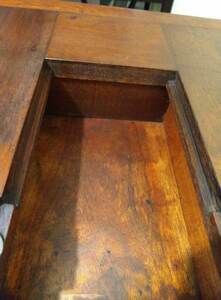 I believe they got as far as refinishing one drawer front before losing interest. So they gave it all to me. I was fascinated, but in the end, after cleaning it up just a bit, decided against keeping it. 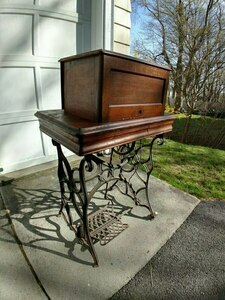 I gave it away on a local town mailing list, to someone who was clearly going to take good care of it. (The next machine I got, my 201-2, came from that very same list, six years later. :-) I probably only owned the Standard Rotary for a month or two. 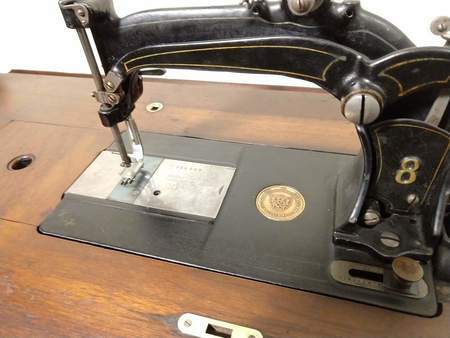 From the looks of it, and from what I’ve now learned about the machine, and the Standard Sewing Machine Co., it was probably made in the late 19th century – the serial number (57930) is relatively low. 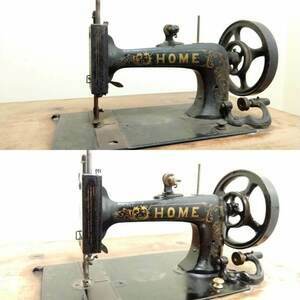 The company was one of many that started up after the early machine patents all expired, making sewing machines much cheaper to build. I love the lack of any cabinetry below the top. 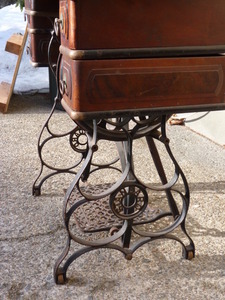 The wooden drawers ride on a delicate framework of cast iron. 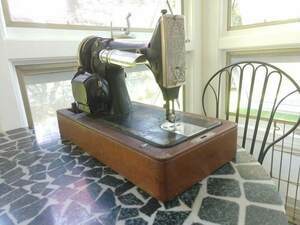 The donor also said they “bought it at a yard sale down the street a few years ago”. 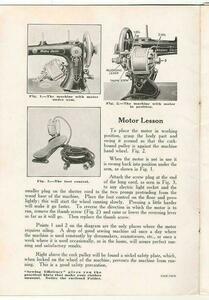 The cast-iron 201 was built (with various configurations of motor and other details) between 1935 and 1954. 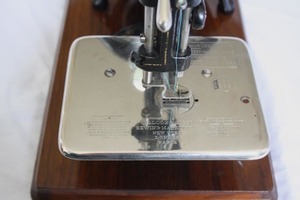 (A different looking aluminum machine took over the model number from then until 1962.) 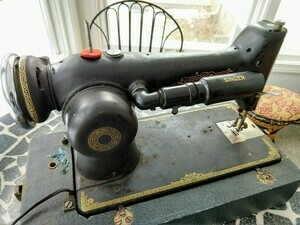 This machine is from roughly 1941. 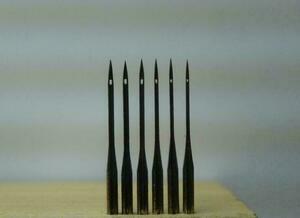 The finish isn’t perfect – there are some chips in the japanning, and the shellac is crazed in some large areas. I haven’t yet detected a problem with the motor. The machine is gorgeous to hear – really. 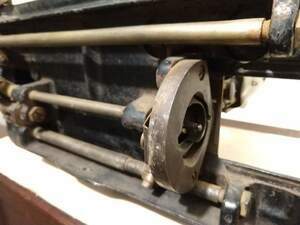 There’s no belt, because the motor drives directly through a worm gear drive, and the overall tone while running is just… different… than a belt drive machine. 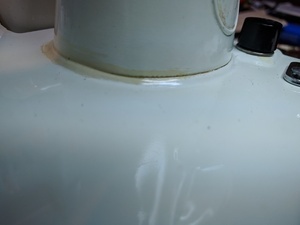 Repairs: As part of a thorough cleaning and oiling, I replaced the motor grease wicks with new, and replaced all the grease with Vaseline petroleum jelly. 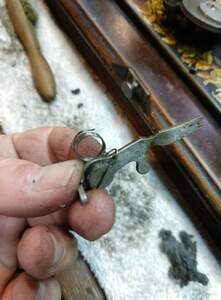 Sadly I broke one of the wick’s spring clips while removing it, and fashioned a crude repair to make it work. 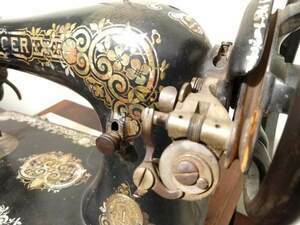 The Model 66 was purchased by my grandfather, Joseph N. Merchant for his bride, Gladys H. Merchant (née Shufelt) in 1918 as a wedding present. 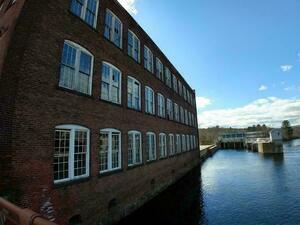 They lived in Worcester MA for ~30 years, he was an engineer on the Boston and Worcester RR, she was a homemaker. They moved to Allston in the early ’50s and she worked at Raytheon in Allston before retiring. 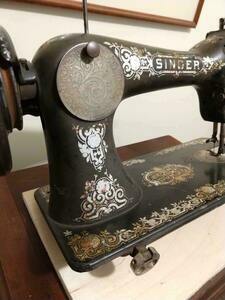 She sewed curtains, dresses, pants, as a regular event. 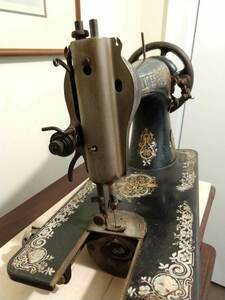 They moved to Framingham in the early 60s and she continued using the machine as needed or requested. My grandfather passed away in the late 70s and she stayed in her house until her last year, 1988. 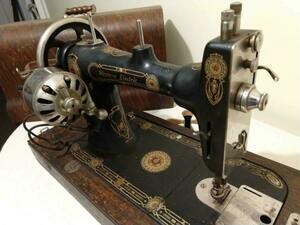 The machine was always covered with a fitted cloth cover she made for it. 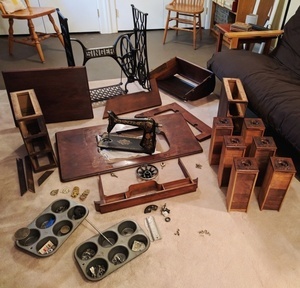 The machine was remarkably complete: all of the original attachments were still in the drawers, and all of the broken cabinet trim had been saved. 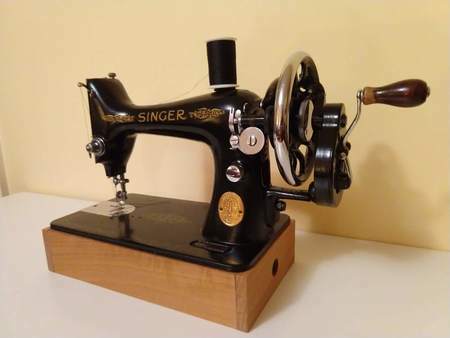 The Singer model 66 was made in various forms from 1902 to 1956. 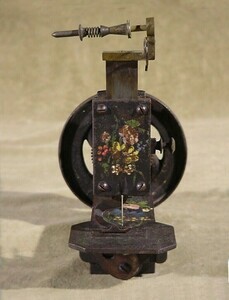 This treadle model was built, decorated with a couple of different decal patterns, from 1902 to 1923. 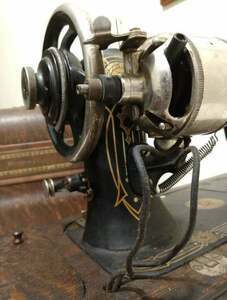 This particular machine is from roughly 1916. 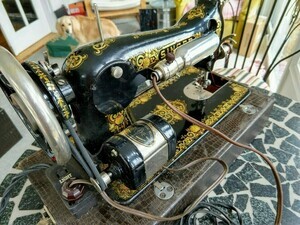 I “restored” the machine, which had gotten very old looking, and which was no longer operational. The whole process took about two weeks, working a few hours a day. The head itself was extremely dirty, and while it could be turned by hand, it was extremely difficult – enough that there was a worry of breakage. 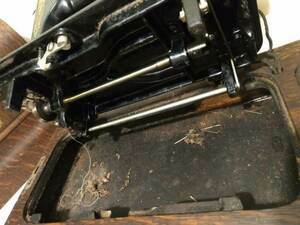 The machine was cleaned with sewing machine oil, partially dismantled, parts freed up, lubricated, and finally waxed (pure carnauba) and oiled again. Some damage to the decals occurred, mainly in the areas that were originally dark green. Most of the dark green was already missing, but there were more gaps after I was finished than before. 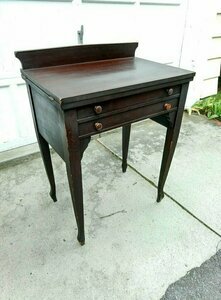 The cabinet had become stained and discolored, and the finish somewhat crazed. The top “working” surfaces were in relatively good shape, structurally, though there was some delamination of the veneer on a few of the edges. 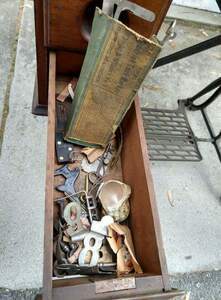 The drawers themselves were in good shape. (One had been previously repaired, since it clearly has a replacement knob.) 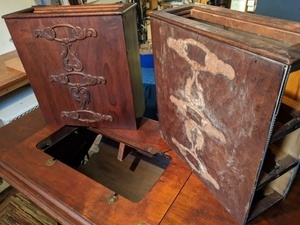 The drawer cabinets were in bad shape: the veneer on all of the large surfaces had begun separating, and splitting, anywhere from 3” to 8” from the bottom of the chest. 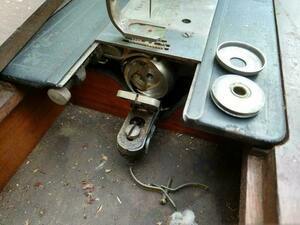 Many of the add-on trim pieces had already fallen off, but had been (thankfully!) saved. 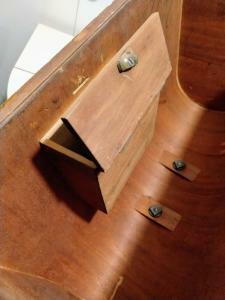 The veneer on the drawer sides was all reattached using Elmer’s woodworker glue and lots of clamps. 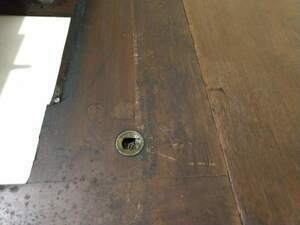 It was repaired without further separating it, using a hacksaw blade to spread the glue into the narrow space made accessible by gentle lifting of the veneer. 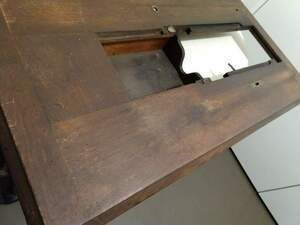 Loose trim pieces were completely removed, and then all the trim was reattached, again using the same glue, and cushioned by padded blocks when clamping. 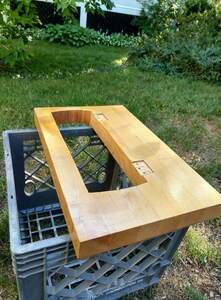 The finish on all the wood surfaces was refreshed with Howard’s “Restor-a-Finish” (mahogany color), applied using steel wool. 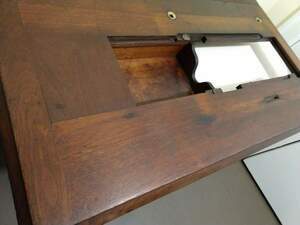 The product is a combination of strong cleaner and furniture stain, with solvents strong enough to soften old finishes. The steel wool helps with the cleaning process, of course, and also smoothes off rough edges of any imperfections (scratches, gouges) in the finish. 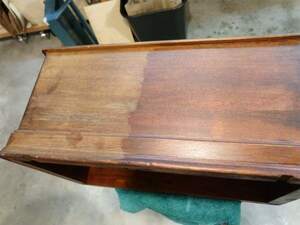 After the Restor-a-Finish treatment, the cabinet pieces were oiled with Watco’s “Rejuvenating Oil”. 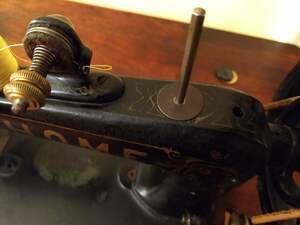 The treadle irons were cleaned with rags and sewing machine oil. 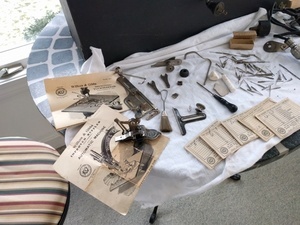 A few pieces that were originally chromed (or nickeled?) 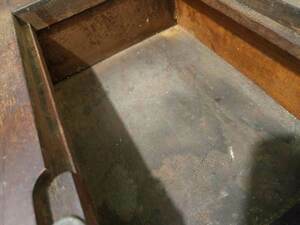 were cleaned up with steel wool to remove rust. 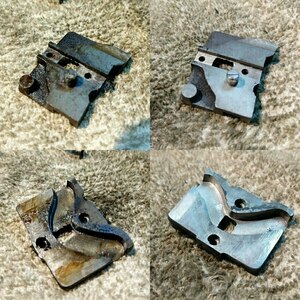 A few small brackets had lost all of their plating, and had rusted. These were cleaned and sprayed with lacquer. 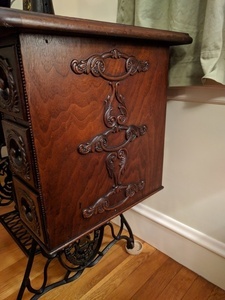 The only parts missing from the machine or cabinet were two small pins, which are designed to keep the top drawer of the cabinet from pulling out too far. 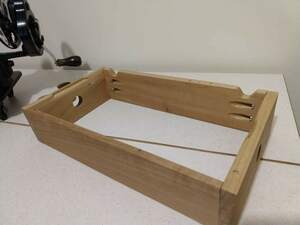 The pins fit in two small holes in extensions of the drawer sides, and their lower ends drop into milled channels in the cabinet after the drawer is inserted. 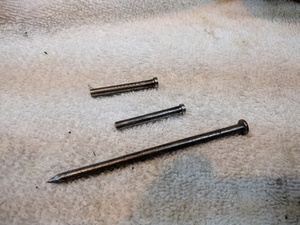 After seeing a picture of the pins in a vintage parts list, I was able to make new pins from a pair of common nails, using my drill press as an ersatz lathe. 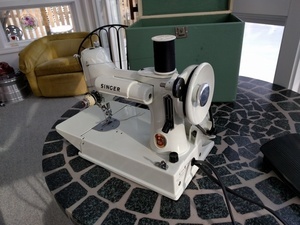 This cute little Singer Featherweight 221 White sewing machine (s/n F 198055, and more specifically, a model 221K7) was owned by Julia’s grandmother, Julia Spain Banta. It came to us in late December 2017, via Julia’s parents who also used it for many years. 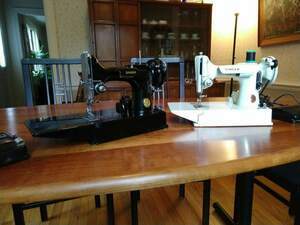 When they learned recently that I had a small sewing machine collection, they gave it into our care. The machine is in very good shape. 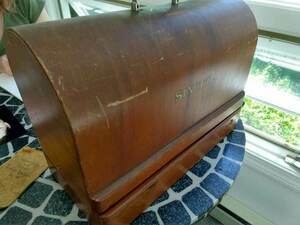 The case, too, is in good condition, with just a few scuff marks. 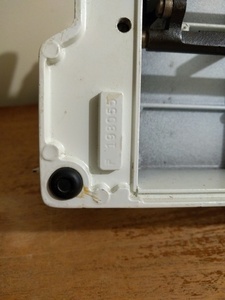 The serial number is a bit of a mystery: “F 198055”, with a clear space between the ‘F’ and the digits. 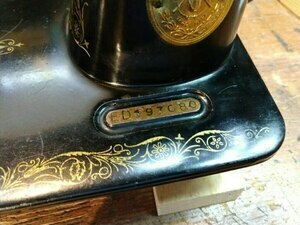 If that number was truly just “F198055”, then it would refer to a model 15K machine, made in 1920. In addition, these models are supposed to have serial numbers starting with “FA” or “FB”. 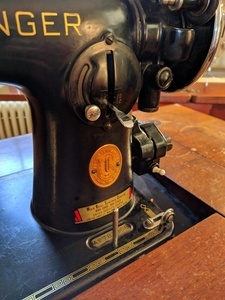 My pet theory (without any concrete basis) is that the letter ‘A’ on the serial number stamping machine at the factory failed, and that this sewing machine is actually an FA or FB machine. This is partly reinforced by something I found, where someone had reported a machine “with a SN of F (then a verrry faint ‘A’) 131629”. If the ‘A’ punch was already failing when their machine was made, it might have failed completely by the time mine was made. By the time the mistake was discovered, it may have been way too late to fix, on way too many machines. There are other mentions of this class of machines with seemingly out of place numbers as well, though I don’t know whether they all start with ‘F’. The gold-colored “badge” was missing. 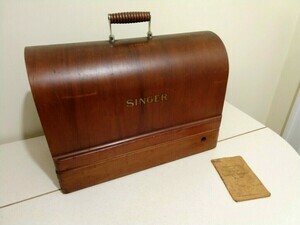 On this model, unlike most “badged” Singers, the badge isn’t a riveted piece of stamped brass – it’s just a foil sticker. Happily, reproductions are available, so that was an easy fix. 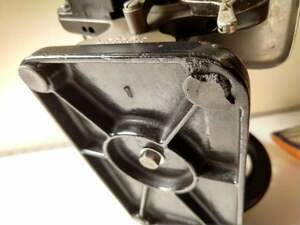 The masonite bottom plate, which acts as a drip-tray for the somewhat oily underside of the machine, was missing. 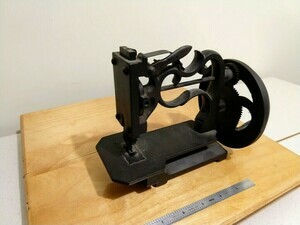 I fabricated a new one based on a picture of the original piece, using measurements from the machine. 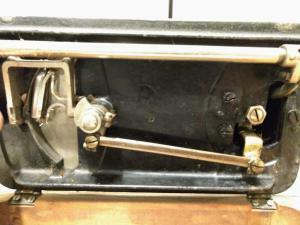 The clamshell speed controller was acting as a simple on/off switch – there was no variable control. I opened up the controller, and found that it has an adjusting screw which allowed the copper blade to press on the end of the carbon resistor as it should. 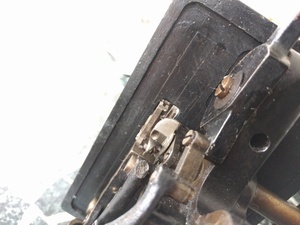 In addition, electric arcing had perforated one of the brass switch contacts. 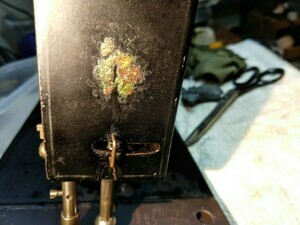 I reinforced this piece by soldering on a strip of copper foil. 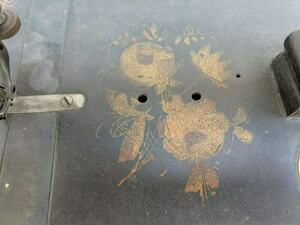 The lacquer on the machine appears to have been retouched at some point in the past. The touchups are obvious now, but perhaps the paint matched better originally. I have no idea where or when this retouching might have been done. 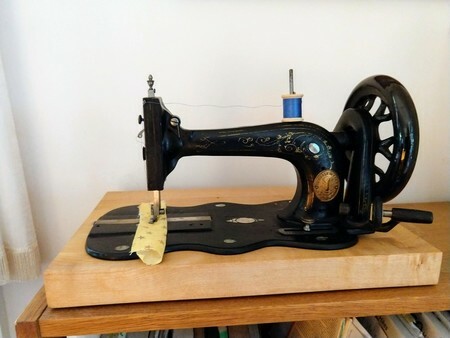 In May of 2018 we were given Julia’s grandmother’s first Featherweight, a black model from 1947. They make a nice pair. 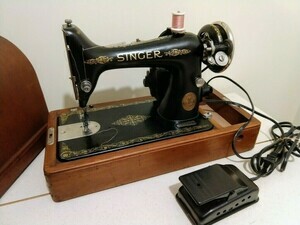 This is the first machine I’ve bought specifically to add to my collection. 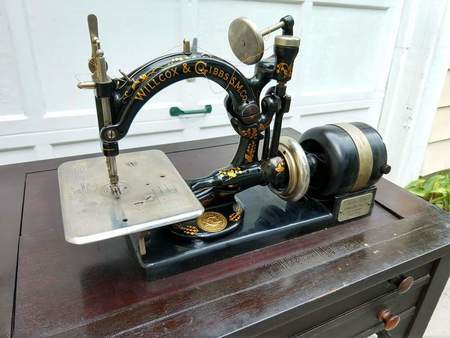 Willcox and Gibbs made and sold this machine, with a few variations, from 1858 through at least the 1930s. I just got it recently (late January, 2018) today, so I don’t yet know all that much about it. 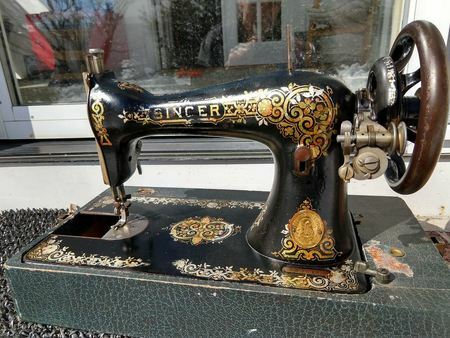 It has serial number A666108, which means it was made 1921. The price was right because a few things are wrong with it. Some I knew before buying (ebay), others I discovered after it arrived. 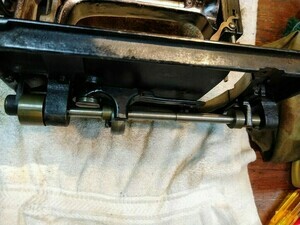 First, the spool arm is broken (and missing), and the connecting link arm for stitch length control is broken (but all there). I knew about both of these when I bought the machine, so they’re okay. 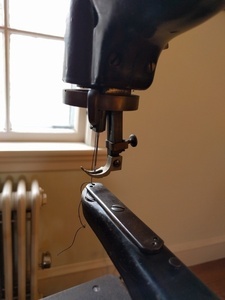 I think I can jury-rig a spool arm of some sort, and I may be able to repair the link, but in the meantime the stitch length is still adjustable from underneath – it’s just not convenient. My machine, however, has a relatively crude unplated, unpolished steel plate. Milling marks are visible on the underside. There’s no engraving, and I believe it’s smaller than the usual plate. Despite the milling on the underside, this plate is much thicker than it should be, which prevents the feed dogs from ever protruding through their slot. The first picture shows the dogs in their fully raised position. But the real problem with this stitch plate is the opening for the feed dogs. 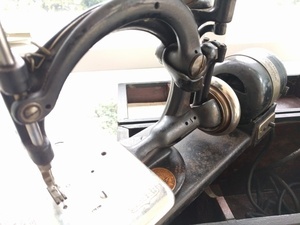 Normally, with the presser foot down, resting on the dogs, the dogs will break contact with the material being sewn as the retract through the plate in order to move to the rear of the machine before coming up for another shove. 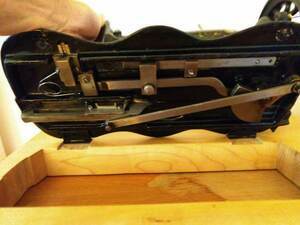 But with this plate, with its gigantic hole, the presser foot simply descends along with the feed dogs, never losing contact. Useless. 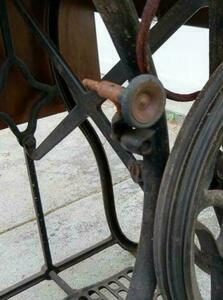 And finally: the axle on which the hand wheel turns is bent. Not much, but noticeably – it wobbles a few degrees when turned. It will certainly vibrate if it spins, so that will keep speeds down. 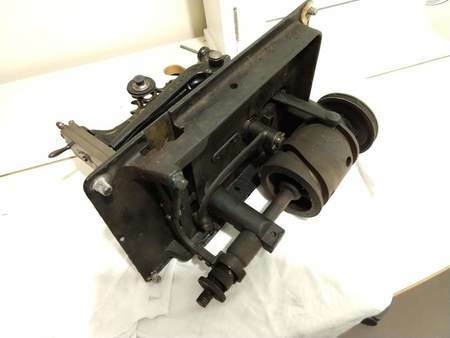 So it’s pretty clear that this machine was dropped – parts are broken, the stitch plate was probably bent and replaced, poorly, and the hand wheel axle is bent. 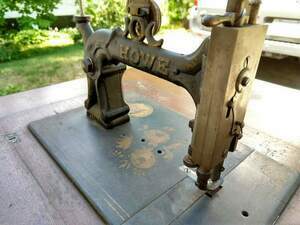 But it’s also clear that it’s been well used, and the damage all seems old, making me think it can probably sew again someday despite its injuries. We’ll see. 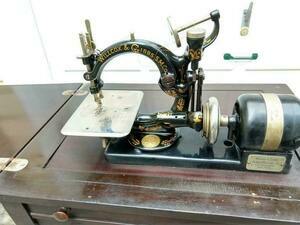 Yes, this is W&G machine number 2. The decals aren’t in as good shape as the first machine’s, but I was sort of thinking it might be a parts donor for the first, and that between them I’d end up with at least one excellent machine. 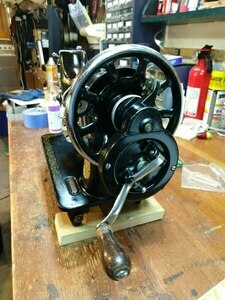 After buying my 1937 electric cabinet W&G machine, I didn’t really have a reason to keep this motor and base in my collection. 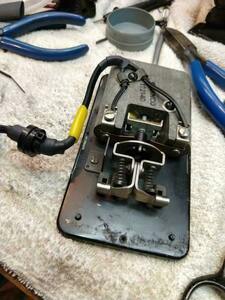 I had repaired and rewired it, and I was able to sell it to someone who needed it. 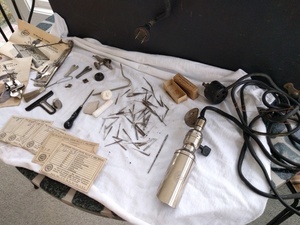 So all that’s left from this purchase is the 1914 machine itself, and the accessories that came with it. The W&G hand wheel has two cam surfaces milled onto it – one to drive the needle arm, and the other to drive the tension mechanism. 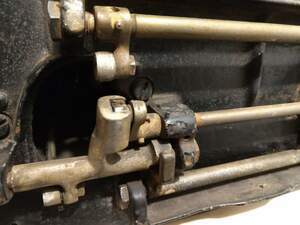 The holes in the two machines’ tension arms are of different diameters, by just a couple thousandths of an inch, and the tolerance is so close that the hand wheels can’t be swapped. The main shafts are different. There’s an small cam milled onto the looper end of both shafts, which drives the feed dogs. On the second machine the profile of that cam is entirely within the outline of the diameter of the shaft. 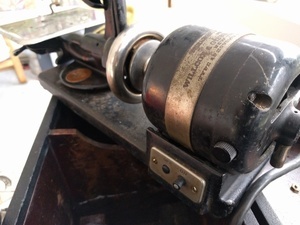 On the first machine, the cam is larger, and “hangs over” the shaft diameter. So they’re incompatible. 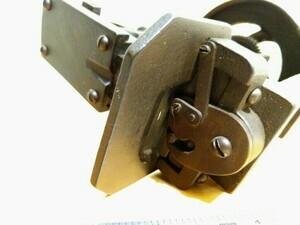 In addition, because of the larger cam, that shaft can only slide out to the left (hand wheel removed). 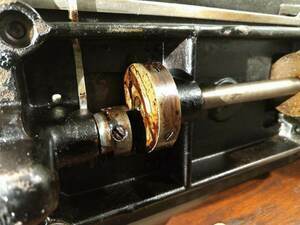 But that shaft is bent at the hand wheel end, so it can’t come out at all – that shaft will never leave the machine. 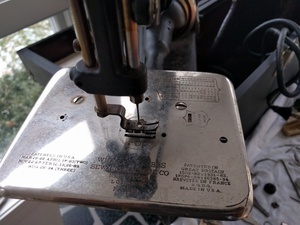 Finally, I was really hoping to move the pretty stitch plate to the prettier of the two machines, to replace the homemade chunk of steel it came with. But that won’t swap because the feed dog mechanisms on the two machines are quite different. 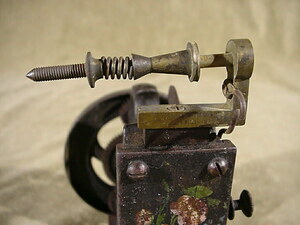 The head of one of the two little screws that hold in the round needle plate (where the feed dogs come through) interferes with the first machine’s feed dog movement. 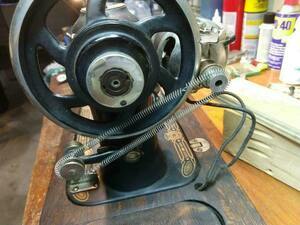 The foot controller for my second chain stitcher was completely dead. I’d found a good write-up on repairing them, but sadly, that controller was very different on the insides than mine. My controller consists (essentially) of two coil resistors and a large flexible copper plate. 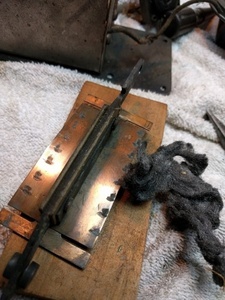 The copper plate makes contact with successive points on the large resistor elements, as the pedal is depressed. The resistors consist of a ceramic tube, wound with very thin wire. That thin wire isn’t what the copper plate makes contact with – it wouldn’t be strong enough, and any arcing would burn through it. 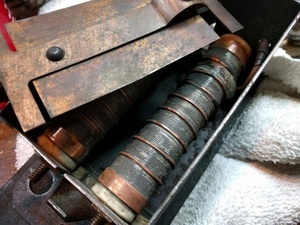 To provide appropriate contact points, the tubes (and the thin wire winding) are each circled with 8 pieces of thicker copper wire, spaced along the length. These are just loops, with the ends tightly twisted together. 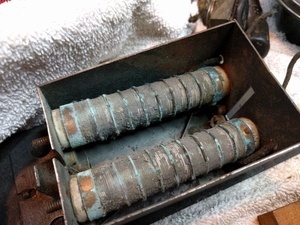 These “wraps” are strong enough to act as an electrical contact with the copper plate, and are tightly held against the thin resistor wire. The whole tube was coated in a gray paste or paint which has dried and flaked off. My guess is that this was meant to keep the corrosion at bay. In the end, I carefully untwisted, removed, cleaned, and reinstalled all 16 of the copper wire wraps, and also cleaned the layers of fine wire underneath while it was exposed. Doing this restored all the right connectivity. Good as new! Then a picture. 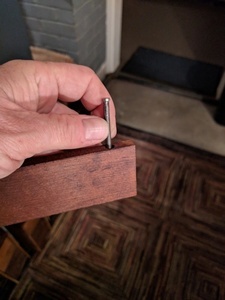 I drilled a series of 5/64” holes in a piece of wood, and inserted a needle in each. 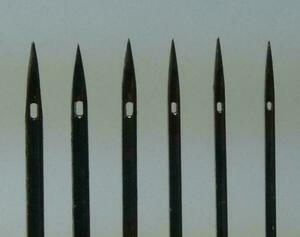 These are just the W&G needles, sizes 4, 3-1/2, 3, 2, 1, and 0. 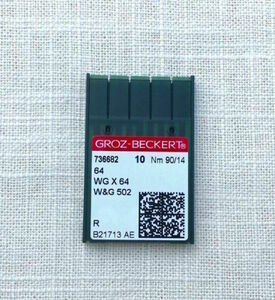 Sadly, I forgot I had the Groz-Beckert needles until after I’d already drilled the holes and taken the picture. 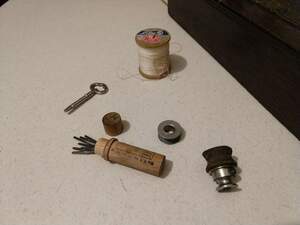 You’ll have to trust me that the hole in the G-B needle is even longer than that of the no.4 – it would definitely be the easiest to thread of the bunch, but its diameter is more like a no.3. 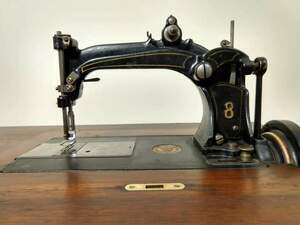 This 1914 machine has always had trouble sewing at the shortest stitch lengths. 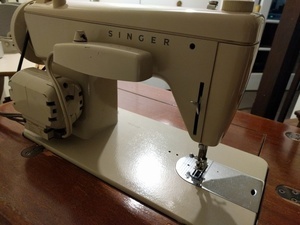 It hasn’t bothered me much, because I really have no need to ever sew anything at higher than 12 to 15 stitches per inch, and the machine sews fine in that range. 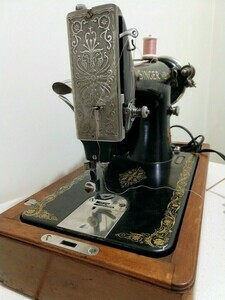 But it’s been on my mind to investigate, especially after another machine (my 1937, acquired later) had the same problem. So I did investigate, and did solve the problem – it was a simple matter of adjustment. 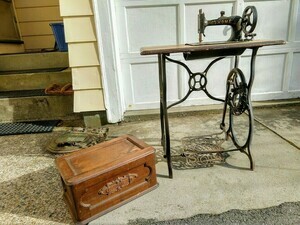 I had told myself, since our house is out of convenient corners with extra floor space, that I shouldn’t collect any more treadle or cabinet machines. 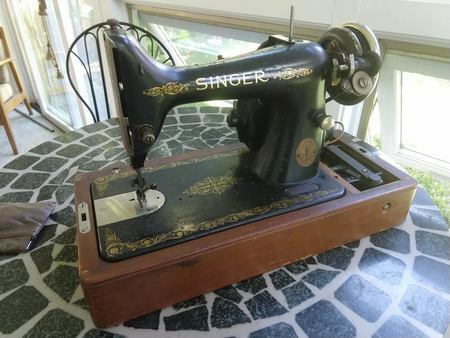 But when I happened to see this machine on Facebook Marketplace, I had to go take a look. 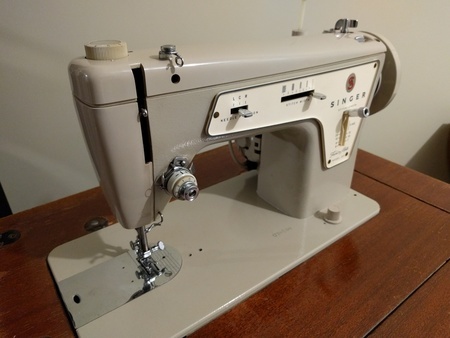 It seemed pretty undervalued (even with my rudimentary knowledge), and sure enough, it turned out to be an early “New Family” machine. 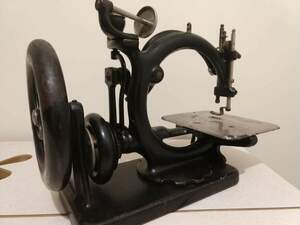 The “New Family” model was created by Singer in 1863, and including a name change to “Model 12”, lasted until 1902 – it was the first mass-market mass-produced sewing machine. 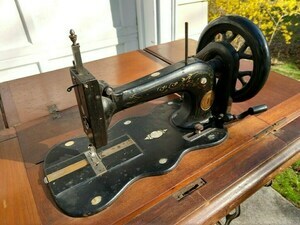 Mine (s/n 618146) was made in 1871. One nice feature of these machines is the type of shuttle mechanism they use, called a “transverse shuttle”. 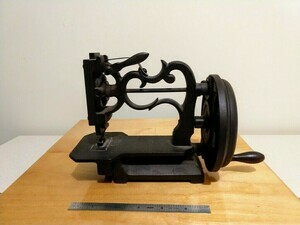 If one thinks of a lockstitch sewing machine as being a sort of one threaded loom, then this is about as close as one can get to that mental model. The shuttle is boat-shaped, with a pointy end, much like a loom’s shuttle. 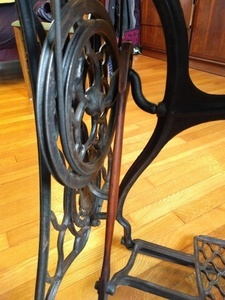 Also like a loom’s shuttle, it carries a narrow cylindrical spool of thread (the bobbin). 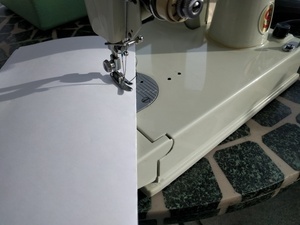 It moves linearly back and forth beneath the presser foot: the needle comes down, and retracts somewhat to leave a small loop of thread. 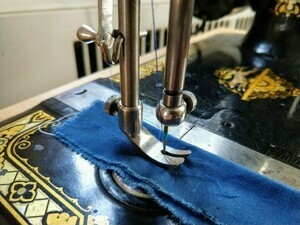 The shuttle passes through the loop from left to right, and the needle retracts the rest of the way, forming the stitch. The shuttle then retreats to the left, and is ready for the next stitch. My machine’s cabinet is in very good shape. 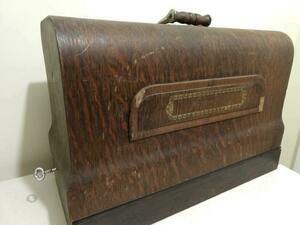 That’s likely helped by it being made from solid boards – no veneer. 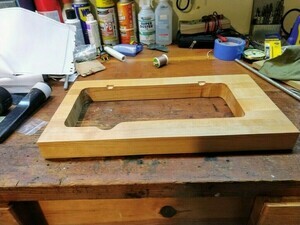 The “coffin” looks like a simple box cover, but actually unfolds in a very clever way to make a large sewing surface. 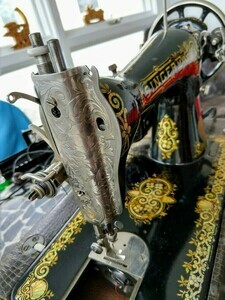 The machine head is also in good shape for its age – the decals are very worn, but the mother of pearl highlights are all present. There’s very little rust, and the paint is mostly intact. 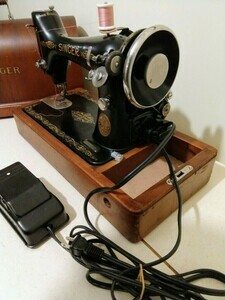 It’s currently missing the shuttle (which holds the bobbin), so it won’t sew for the time being. 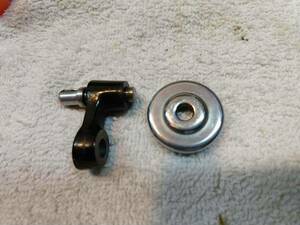 along with The axle and wheel for the bobbin winder is also missing, as was the tension adjusting screw, but I’ve been able to get a replacement for that. Everything else seems to be there. 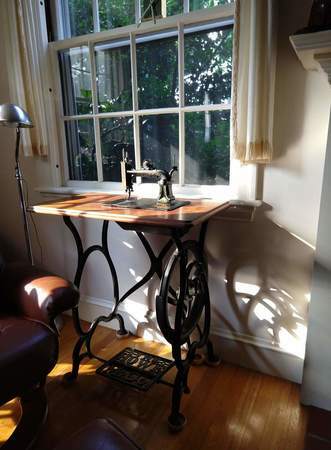 The treadle irons are rusty near the floor, but should still clean up pretty well. The original ceramic (I think) casters are both intact. I love the free form design of the irons. 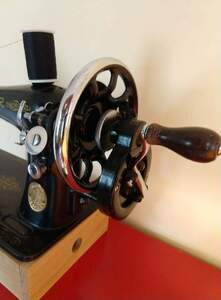 I was able to procure a Model 12 shuttle, and a matching bobbin winder assembly, from Helen Howes in the UK. With shipping, they cost about the same as the rest of the machine. All in the name of the hobby, I guess. 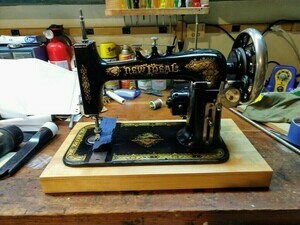 I had some trouble initially getting the machine to sew, but with lots of advice from the folks on the Victorian Sweatshop forum, I got it sorted out. It turns out the only real problem was with my replacement shuttle. There’s a springy piece of steel that runs along the side of the shuttle, which helps keep it aligned and in place during its travels to and fro. 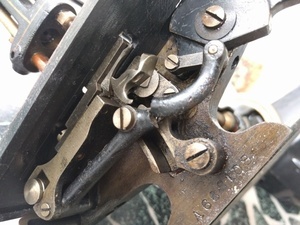 The rivet which should hold that piece in place had become loose on my shuttle, allowing the spring to catch on the underside of the feed dogs midway through the shuttle’s forward stroke. I took a video of the problem. 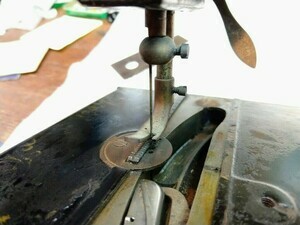 A punch and a small hammer took care of tightening the rivet, and all was well. 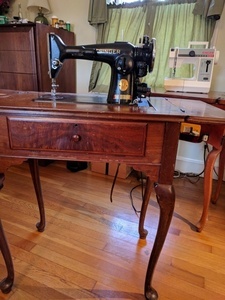 Sadly, due to the lovely fold-out design of the treadle top, I can’t display the New Family on its treadle, since to open it up requires too much floor space. So I made a simple display base, and it fits on top of a bookshelf. Looks fine. That’s pictured at the top of this blog entry. 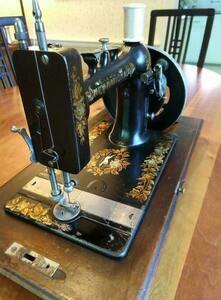 I’ve been thinking of selling this machine, since it’s so hard to display properly. As part of putting an advertisement page together, I took some photos of the folding top, and realized I’d never really shown that feature here. It’s pretty cool. 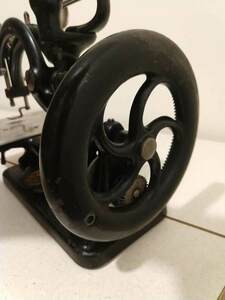 I’ve wanted a hand crank machine for a while – partly just to try sewing on one, and partly because there are just three common ways to power a sewing machine, and I already have examples of the other two. 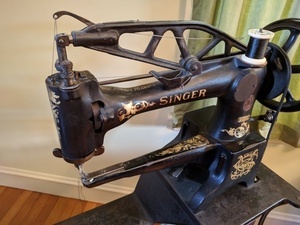 The Singer Model 99 is closely related to the Model 66 that I have in treadle form – it’s basically identical, just shrunken a bit (1-1/2” lengthwise, 1/2” back to front), making it more portable. 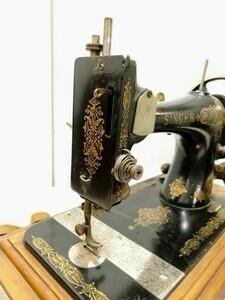 It was produced from 1911 to 1962 or ‘63. This one (ED197080) was made at the Scottish Kilbowie plant in 1941. 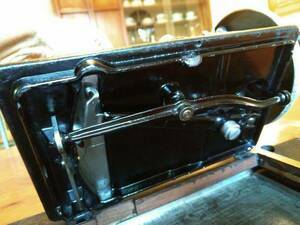 The hand crank is original – there is no wear whatever on the hand wheel pulley, so it’s likely never been treadled or attached to a motor. 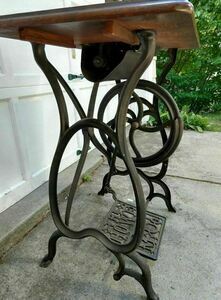 These pictures were taken after a fairly superficial cleaning – the paint was wiped down with sewing machine oil, and the prominent chrome pieces were rubbed with steel wool. 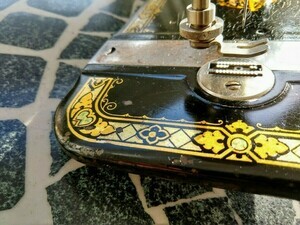 The bobbin slide plate is missing, and I’m hoping to find a vintage replacement. Modern replacements are available, but they look like what they are: modern replacements. Of course I’ll need to find, or build, a base of some sort to make the machine useable. But I can afford to do a little work on it. 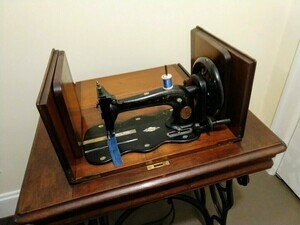 Later… Okay: display case has been built, the bobbin and needle plates have been replaced, and spit and polish applied. Looks pretty good! A second Featherweight joined the family. Or, rather, it stays in the family, thanks to my generous in-laws. 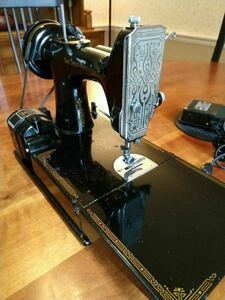 Like the white 221K Featherweight I already had, this 1947 black Featherweight (AH198050) also belonged to Julia’s grandmother. She must have liked it, given that she bought a second! 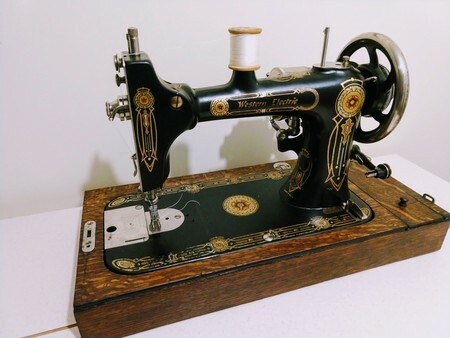 This one needed a little more restoration than the first – the electrical cords were worn through, the rubber foot pads had turned to goo (literally! ), and there was a fair amount of dust and cat hair to clean up. But it’s a solid little machine under all that. I wanted to rewire it with something that was at least a little bit “vintage”. Regular modern zip-cord didn’t seem like it would look right. I found a place that sells cloth-wrapped cord, and got some in black. (They had both cotton and rayon – I chose rayon.) 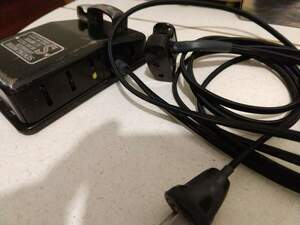 The original cords had clearly failed due to lack of strain relief where they entered the controller and plug, so I used layers of shrink wrap to add protection there – perhaps too much. 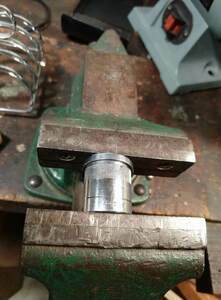 After that, a squeeze or two in the vise flattened out the wheel, and I had a couple of Craftsman sockets (both 19mm, from two different sets) that were just the right diameters to gradually work out the out-of-roundness. 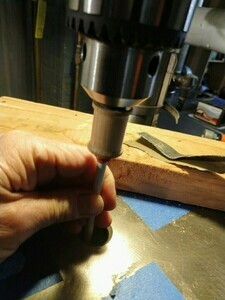 I forced each in turn into the cup of the wheel, again using the vise, and also did a bit of hammering on the rim to get out the remaining high points while it was still on the socket. The result is way better than I expected. 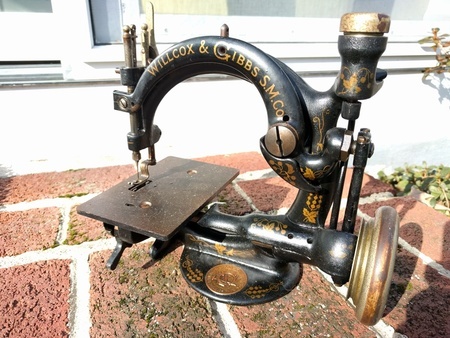 This 1880-ish Wheeler and Wilson model No.8 is complete, it turns over (sluggishly), the cabinet is in good shape, and it has quite a few accessories, including more glass presser foot inserts. Clearly it needs work, but I’m really pleased with it. Stay tuned! Oh – and there’s a nice write-up on the No.8 on the ISMACS site. 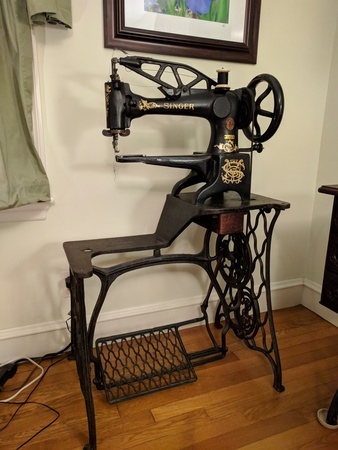 Okay, I’ve finally done an initial cleaning and oiling of the machine’s head, cleaned up the treadle irons, and refinished all of the wooden parts. I’m very pleased with the result! 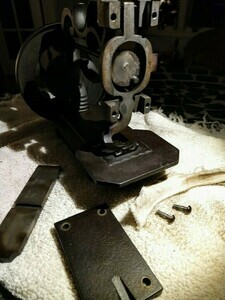 In addition to cleaning the case, I’ve also cleaned the head enough to get it to sew. 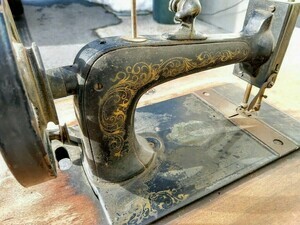 I have trouble imagining how sewing machines get so dirty sometimes. I think in the case of the old ones, it’s the oil: they would originally have used sperm oil (i.e., from sperm whales) rather than a petroleum-based oil. When the sperm oil dries, it leaves horrible, hard, brown, caked-on crud. Yuck. 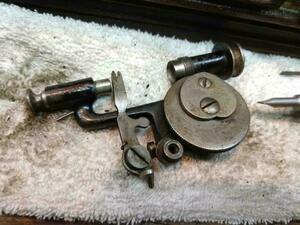 These parts didn’t get cleaned: it would have been hard, and the mess isn’t hurting anything. It looks liquidy in the pictures, but it’s not: it’s like hard shellac. 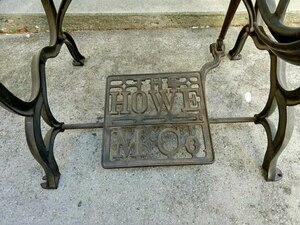 As with my Singer Model 66, I used Howard’s Restor-a-Finish on this. I haven’t yet seen any compelling reasons not to use it, and it’s practically “wipe-on/wipe-off”. The results are perfect, for my taste. “Patina” (that’s latin for nicks, scratches, and stains, right?) is preserved, while the piece becomes living room friendly. 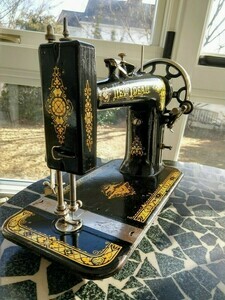 I might not use it on fine furniture, or on something where preserving the original finish was crucial, but for a mass-produced sewing machine? Sure. Oh – the other product that makes this stuff easy is Evapo-Rust. Just soak a rust-encrusted part in it, and all the brown flaky crud disappears. As a bonus, it’s safe, non-toxic, and can be poured down the drain when it’s used up. 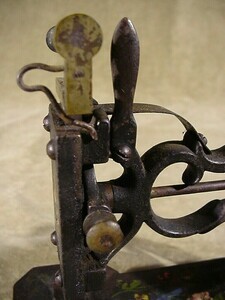 Here’s the bobbin winder, which is made of a different alloy than the cast iron treadle irons, so it had rusted badly. But it’s fine now, other than still needing a rubber tire, obviously. I don’t need, or even particularly want this machine (Y702893). But the bent wood case is in pretty good shape, and my 99K hand crank doesn’t have a case at all. So I bought it (quite cheaply) for the case. 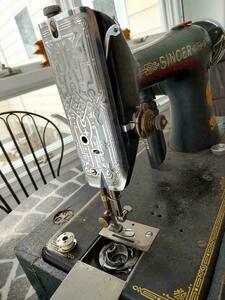 As it happens, the machine is in reasonable shape, though it needs badly to be cleaned, oiled, and rewired. And the controller has some dead spots, and the the controller knee lever is missing, (Okay, maybe my definition of “reasonable shape” is starting to skew a bit.) I’m not sure what I’ll do with it – now that I have it, of course, my “preservationist” side keeps saying “Restore it! 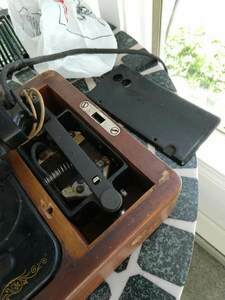 Restore it!”, while my practical side says “Just fix the case so you have a complete hand crank model, which is all you ever wanted.” I wonder which side will win? Well, in the end I couldn’t bring myself to part out the machine. So I gave it a new foot controller (the knee controller was burned out and unfixable, and the knee bar was missing in any case), shined it up, refinished the case, and sold it. It looked pretty good by the time I was done. 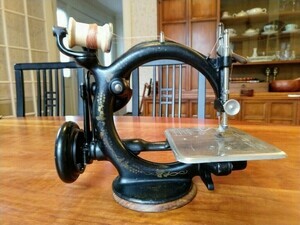 I got this cute little chain stitcher from Julia’s brother-in-law for my birthday. 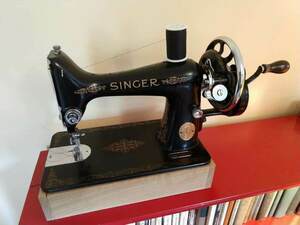 The Singer toy machines don’t have serial numbers, but various features on this one show that it was made in the 25 years or so between 1926 and 1950. :-) It has a little rust on the cloth plate, and the felt on the base could be replaced, but it looks and works fine otherwise. 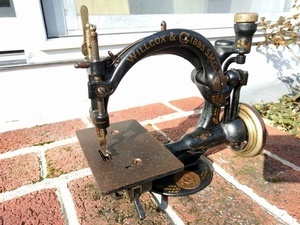 It’s an excellent machine for demonstrating how single-thread chain-stitchers work, since unlike my Willcox and Gibbs machines, it’s light enough to hold and operate in mid-air, and the underside offers an unobstructed view of the hook. 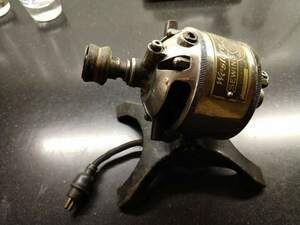 I’ve been on the lookout for a hand crank for my W&G machines for a while, so when this popped up on Craigslist, I grabbed it. It didn’t hurt that it was dirt cheap (relatively speaking). 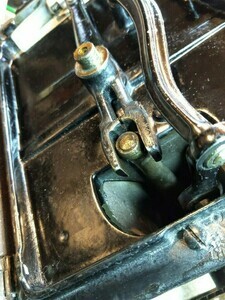 The only big issue is that the crank handle itself is missing, along with the screw that holds it. Of course the missing screw is 11/64”, and 40tpi. 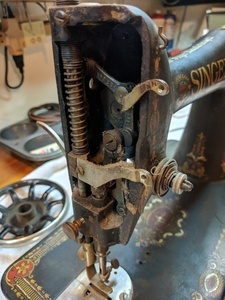 That’s the same threads as the W&G attachment thumbscrews, and, ironically, also the same as the crank handle screw on the Singer Model 20. 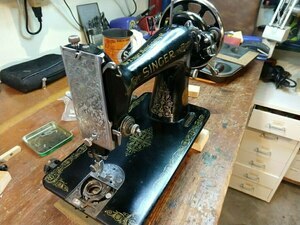 Maybe I can share my Model 20’s handle between the two machines! In reality, I may end up drilling and tapping the wheel for a more modern screw size. 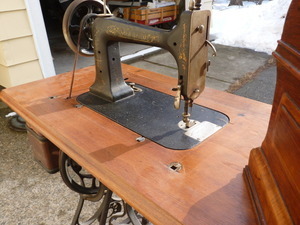 But in the end, I bought this machine not for the machine, but for the hand-crank base. 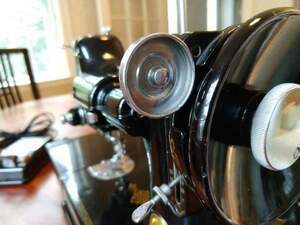 Here’s my second W&G mounted on that base, after a cleanup, and sporting a replacement crank handle – which really is for a Singer Model 20. It’s small, but it will do, for now. 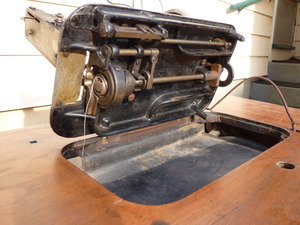 The hand-crank base’s feet were shot: mushed out, brittle, and, while they would still protect a tabletop, they’d lost any stickiness they’d ever had, so the machine wouldn’t stay put on a smooth surface while sewing. 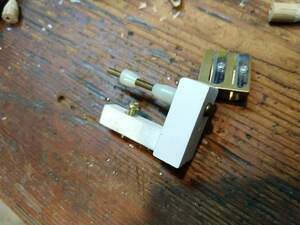 The feet are of the “rubber plug” type, which fit into holes milled in the base. The holes are just under 1/2” in diameter, and 1/2” deep. It turns out McMaster-Carr carries the perfect replacement, as part number 9305K32. They’re in the “Push-In Bumpers with Compressible Stem” section. They fit perfectly, and have plenty of “stick”. The second picture shows one new foot installed (on the right), and also shows an old foot shaved off with a razor blade, before I pried the rest out with a thin-but-strong screwdriver. 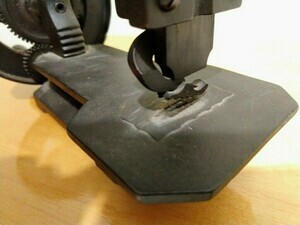 If you have a situation like this, and don’t have proper replacements, trimming the foot flat leaves a nicer surface for a stick-on foot than prying out the old rubber and leaving a hole. 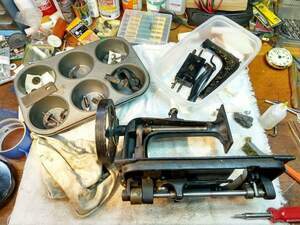 While I still have the castings for the 1904 machine itself, most of its parts have been transferred to the 1893 machine that I got with my treadle base. 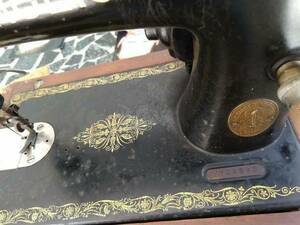 The decals were good on that machine, and, let’s face it, that repair to the 1904’s needle arm lever wasn’t very attractive. I’ve made several bases for machines now. I’ve used three different techniques. It’s been fun. 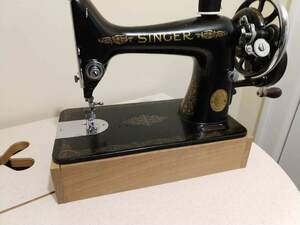 My Singer 99K hand-crank didn’t come with any sort of base, or case. Because I might like to travel with it someday, and room in our van is limited, I made the base as small as possible. 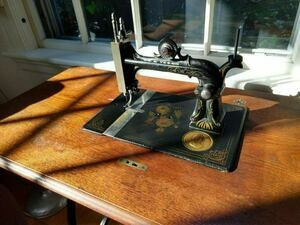 There isn’t yet any attachment of the machine to the base – I’ll deal with that when it’s used for more than displaying the machine on a bookshelf. I used my Kregs jig to install pocket screws to hold it together, and carved the top to match protrusions from the base of the machine. 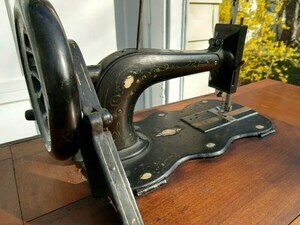 It’s barely larger than the sewing machine’s base. The holes in the ends are for one’s fingers, when picking up the machine. My mother’s FashionMate 237 originally came in portable plastic carrying case. I was dumb, and got rid of that when I found a floor cabinet for it. 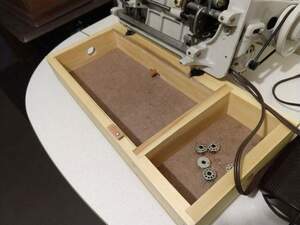 Now I don’t have room for the cabinet, so I again need a small base to make the machine useful. 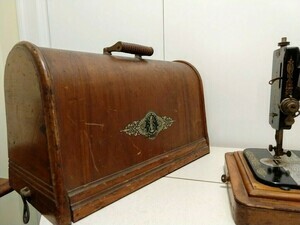 This one actually uses hinges, just like a “real” case. I did my first rabbet joints for this one. 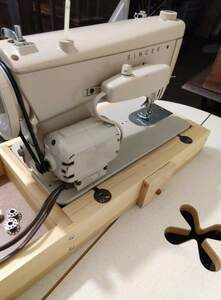 I also included an extendable “kickstand”, which does two things: it keeps the base from flipping up when the machine is leaned backward, and gives the back of the machine something to rest on. 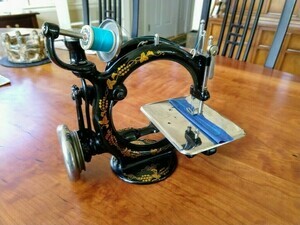 My Singer New Family came in a beautiful treadle stand, with a flip-out cover that forms a large sewing surface. 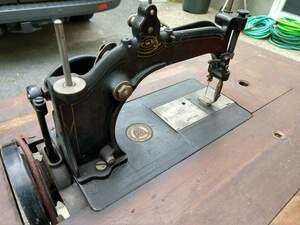 The trouble is that when the the machine is displayed in the open position, the effective floor space taken by the treadle base and surface is huge. So I needed a more compact way of putting my oldest machine on display. 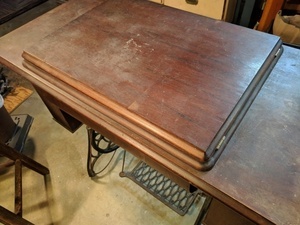 I repurposed an old butcher block top, which had the necessary depth. It was pretty easy to cut with a hand-held jigsaw. 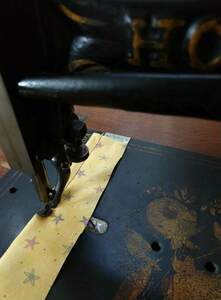 The outline for the cutout came directly from a tracing of the treadle top. 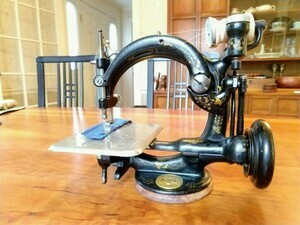 This machine is known as a “Stockwell Howe” to differentiate it from earlier Howe sewing machines made by another branch of the Howe family. It sat on Facebook Marketplace for at least a month before I decided to look at it. 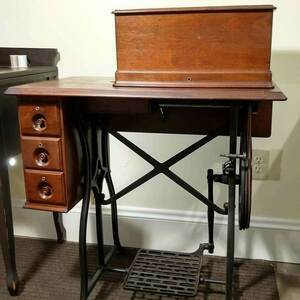 It’s in very good shape – the seller said it came from his grandparents house. They must have taken good care of it. 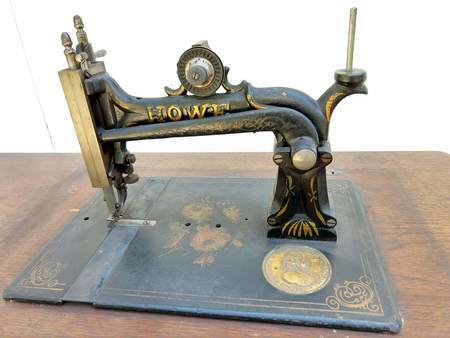 “Letter A” is simply The Howe Machine Company’s name for the model. 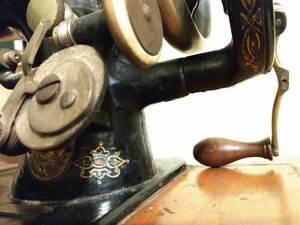 The Letter B, C, and D machines were bigger and successively more industrial. 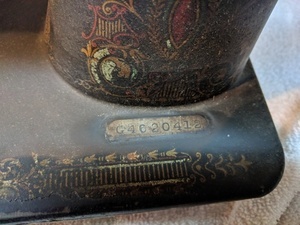 The serial number (178732) dates it from 1871. 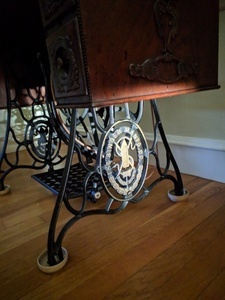 Note that unlike most other machines, there is no wheel above the table. 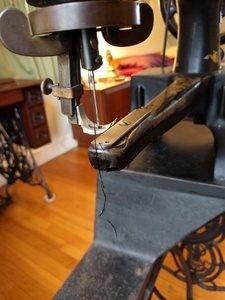 To start the treadle, or move the needle, one must reach underneath and pull on the belt. 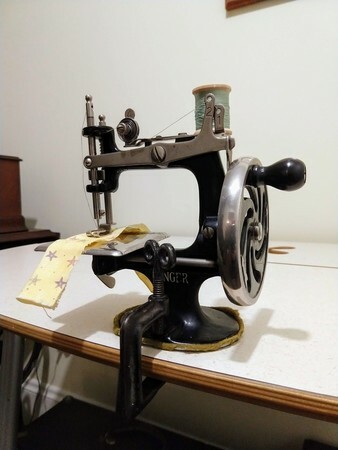 There are essentially three things which must move in synchrony on a sewing machine – the needle, the shuttle or bobbin, and the feed dogs. 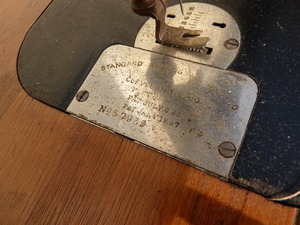 On this machine the L-shaped needle bar is driven by the right most groove in the large drum underneath. The groove to its left drives the shuttle forward and backward under the needle. The feed dogs are driven by a much smaller eccentric cam near the left end of the shaft. 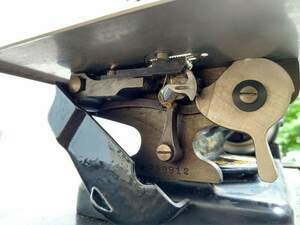 Stitch length is controlled by turning the knob at the left end, to adjust how much the cam moves the feed dogs. 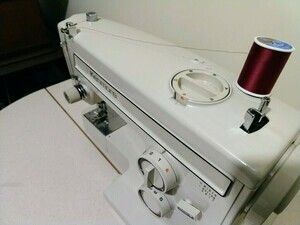 And after minimal setup, it sews!! I made a short movie which shows the machine in action. There’s no cloth or thread, in order to show how the shuttle moves. I love that this was made in 1871. 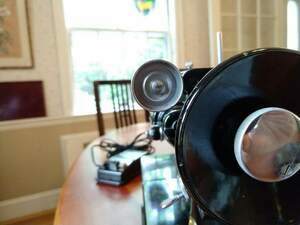 I couldn’t resist picking up this Western Electric machine (s/n A80864), which dates from 1917 or 1918. At least, those are the commonly internet-quoted dates of manufacture. I’ve not been able to find a hard reference. 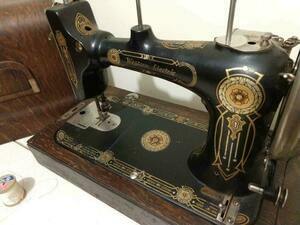 The machine was actually built by the National Sewing Machines company, and badged for W.E. 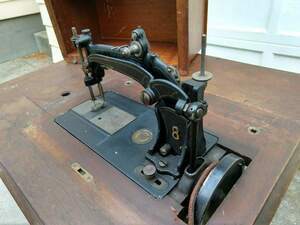 It’s the same machine as the National Model ‘A’, or perhaps ‘A2’, introduced in 1910, and electrified for Western Electric in 1917. Perhaps Western Electric only badged it for two years. Partly I wanted it because the decals are pretty, and fairly well preserved – I don’t have many machines with pretty decals. Plus, I used to work for AT&T, which was Western’s parent company. 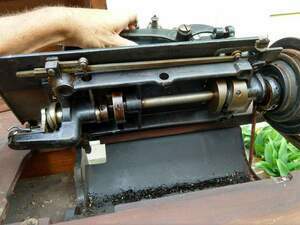 But it also has this crazy motor arrangement, where the motor is mounted on swivels, and its position is controlled by a spring: it can either live tucked into the machine for storage, or swiveled to where it drives the hand wheel via a friction wheel when in use. I have two friction wheels – one is the original cork covered one (at least, according to the manual), and the other is a later rubber one. Interestingly, about half of the old pins I found under the base couldn’t be picked up by a magnet – I believe they’re plated brass. 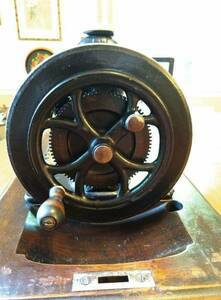 The bobbin winder is also unusual – it’s driven directly from the motor by a coiled metal spring “belt”. 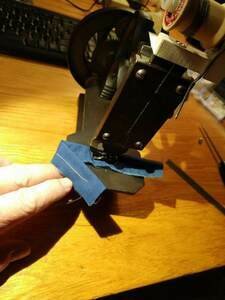 When doing this, the friction wheel is held off the hand wheel by deploying a small arm. Sadly… after a thorough cleaning, and testing, and dismantling, and diagnosing… the motor is dead. 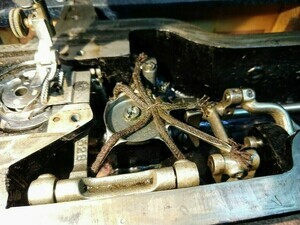 There’s a break in one of the field windings, and the armature windings seem to be shorted together. So, it’s to be a shelf queen. Oh well! But at least it did clean up nicely! I found a motor! 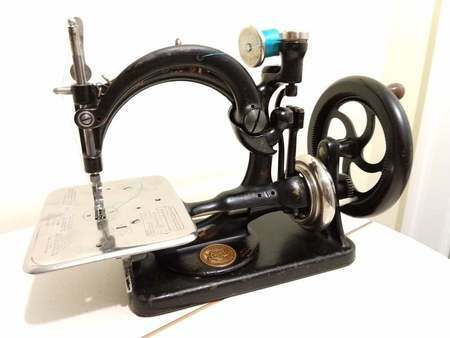 It was sold originally as a general purpose sewing machine motor – you could use it to convert your treadle machien to electric power by sitting this thing behind your machine, with the roller in contact with your hand wheel. 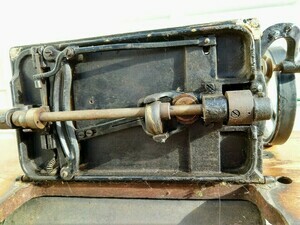 The motor was spring mounted. It’s identical to the motor that came with my machine. 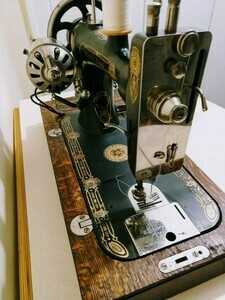 I had to rewire it, and I even had to straighten its bent shaft (it must have been dropped), but it now works, and the machine can sew. I’m very pleased, even though the shaft still isn’t quite straight – it causes a fair amount of vibration. 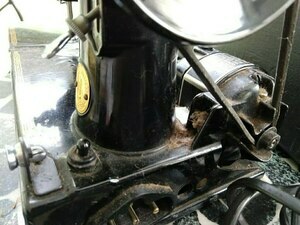 But it’s better than not working at all – and having the nameplate on the motor is worth a lot too. This machine is so pristine that it probably wasn’t originally mounted in this cabinet, which shows quite a bit of wear. 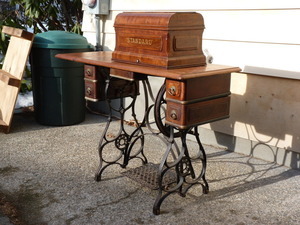 That’s okay – the machine is lovely, and the cabinet is very cool. 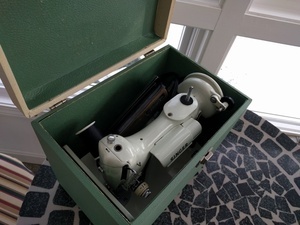 I’ve wanted a dedicated hand crank machine for a while, where, by “dedicated”, I mean a machine that was specifically built to be cranked by hand, and not powered by other means. (And no, my toy Model 20 doesn’t count!). 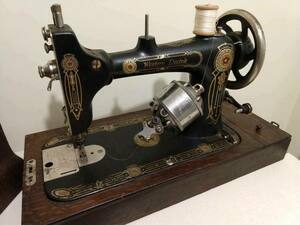 The prettiest machines of this sort are “Saxonia” machines, so named because so many came from Germany. Sadly, since they’re mostly German, there aren’t that many here in the States, and the nice ones are very expensive. 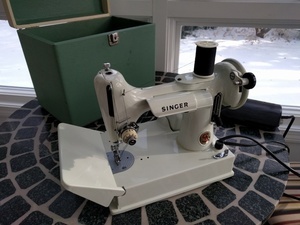 So I wasn’t really expecting to satisfy my with with a machine built practically next door, in Orange MA, by the New Home Sewing Machine Co.
New Home only made one machine in the Saxonia style, as far as I can tell. 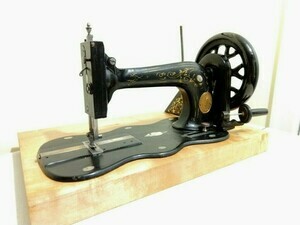 The “model U” was made with variations from the 1880s to the 1930s. 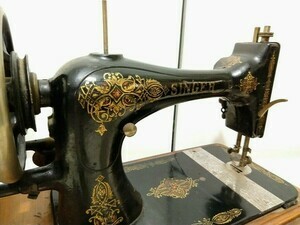 Mine (s/n 2589510) was made in 1906. The outsides had been wiped down well enough, but given the amount of gunk and crud I had to clean from… everywhere else, and from the wear on some of the decals, I’d say it was well used. Happily, not all the decals suffered, and most are in very good shape. 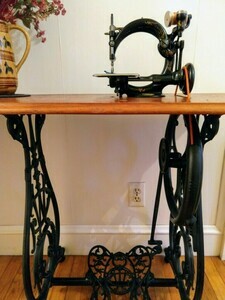 Unfortunately it was missing a shuttle and bobbin, but I was able to get those, and it now sews perfectly. 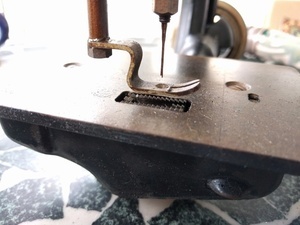 Interestingly, there are holes in the portable base for a treadle belt to pass through. 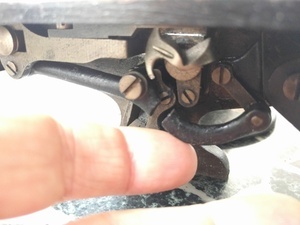 The holes don’t line up with the pulley groove on the crank wheel, though, so it’s likely the base and machine aren’t a properly matched pair. (When that mismatch occurred is anyone’s guess.) 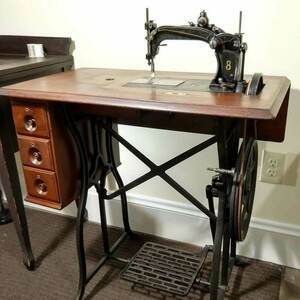 In any case, the base was apparently designed to sit or slide into a matching treadle base – so that the machine it held could be either treadled or cranked. 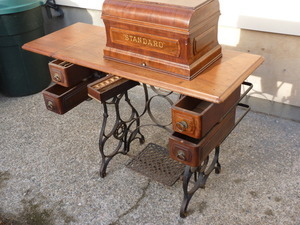 An early example of modular design, I guess. 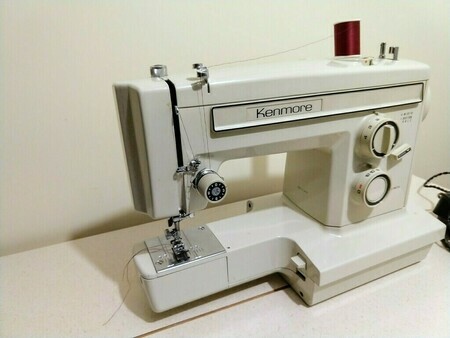 I got this Kenmore when someone on the town mailing list gave it away. 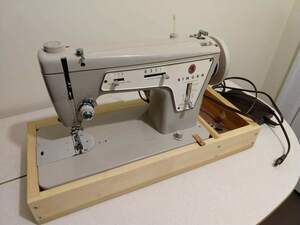 Has a bunch of built-in stitches, including semi-automatic buttonholes, and, more importantly, it’s a free arm machine, which would be awfully convenient sometimes. This diminutive little thing (only 10” long, including the crank handle!) dates from about 1859. 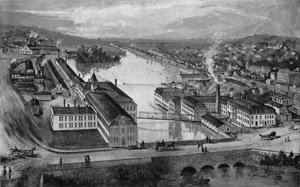 Charles Raymond was building inexpensive sewing machines in Brattleboro, VT. Sometime in the next couple of years he moved his company to Guelph, Ontario, to avoid pressure from the “giants” of the industry, and their attorneys. Even if he wasn’t infringing, it would have been prohibitive to defend against Singer, or Wheeler and Wilson. 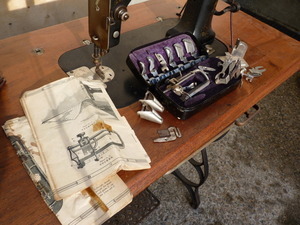 The machine sews a chain stitch – the loop is caught and held until the next loop can be slipped through it. 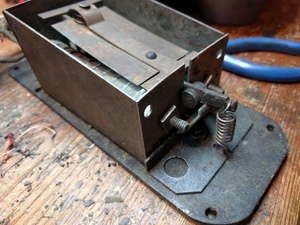 (Simple, but not as simple as the looper that James Gibbs had invented just a couple of years earlier, used in the Willcox & Gibbs machine earlier in my blog.) 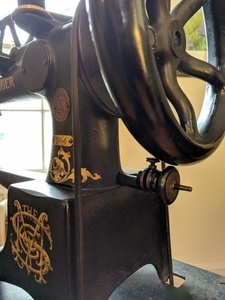 There are no feed dogs on this machine – instead, the presser foot is a “walking” foot. 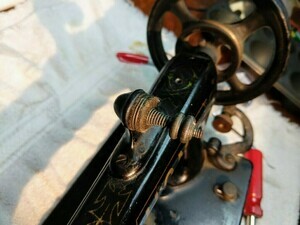 The needle holds the cloth in place while the presser foot lifts and moves forward to grab the cloth in a new spot. 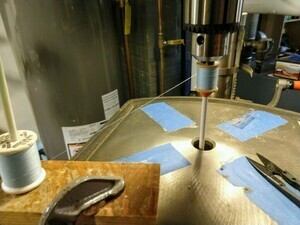 When the needle rises, the cloth is slid to its new position. 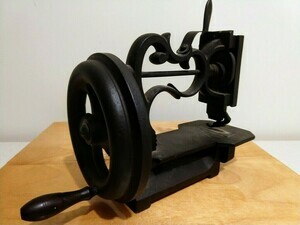 This style of machine, created by Charles Raymond, was copied by many small manufacturers – it was cheap to make, and very simple to use. 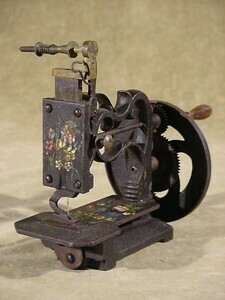 The style became known as the “New England Sewing Machine”. 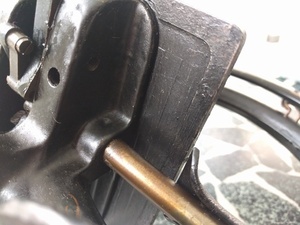 Sadly, my machine is missing a couple of crucial parts: There’s a threaded rod/bolt that should be installed in the hole near the left end of the upper shaft. This rod would ride on a cam (not really visible in the pictures), and would cause the presser foot to do its walk. 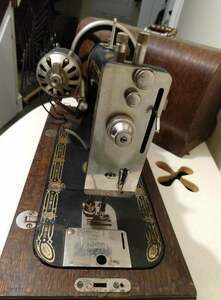 Also missing is the bracket and spool pin which is normally mounted on top of the large rectangular needle bar at the upper left corner of the machine. 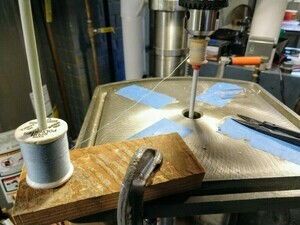 The spool is mounted mounted horizontally, and the thread unwinds directly down to the needle. 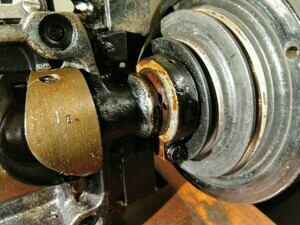 Thread tension is applied by drag exerted on the spool by a spring which keeps it from turning freely. Hopefully I can recreate these parts someday. 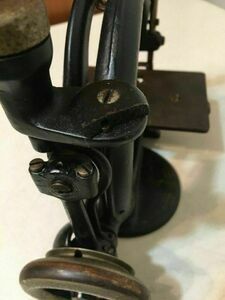 One clue (among others) to the age of the machine is the little notch worn in the cast iron faceplate, above the upper righthand screw. 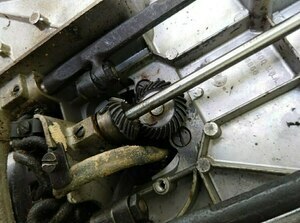 This means the machine probably had a tensioner setup just like the one shown in a video, from Alex Askaroff. 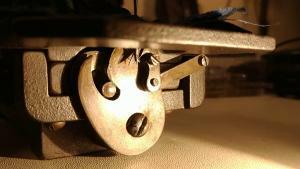 The springy-wire part of the tensioner would have worn that notch. 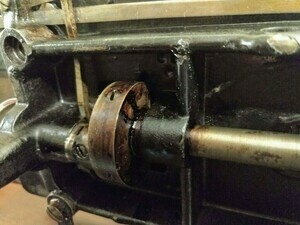 There are better pictures of that spool assembly and tensioner on Alex Askaroff’s webpage – specifically this one and this one. 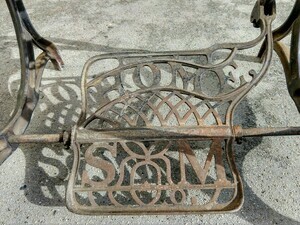 Given the features of the casting, and the wear mark, I think it’s safe to say the machine was made in either 1859 or 1860. But amazingly enough, it worked on the first try! So I made prototype spool holder no. 2, also using cellular PVC, and some slightly nicer hardware. The PVC got a coat of Sharpie. Classy, eh? Someday maybe it will get a proper brass spool bracket. Until then… this will display well enough. 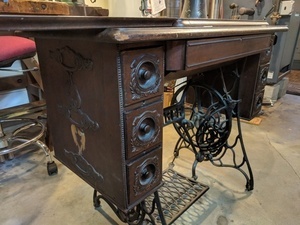 The treadle top is also incomplete: it has no bonnet (or “coffin top”, as they’re sometimes called), and it should have at least one drawer hanging under the right end of the table top. 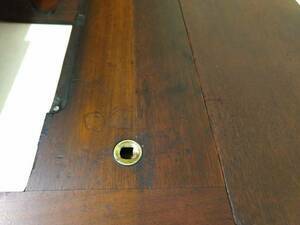 In addition, there’s a crudely drilled oblong hole in the middle of the table, as if someone tried to turn the top into a lamp stand. 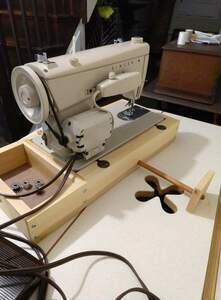 Happily that hole is mostly covered by the sewing machine when it’s installed. 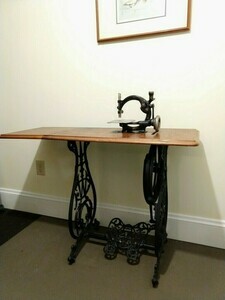 I’ll certainly install a different one of my machines in the treadle. 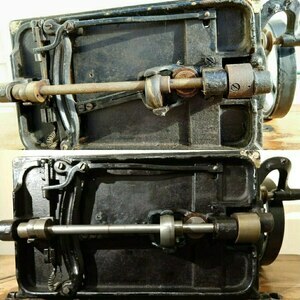 I’ll also look into swapping parts, in one direction or another, with my 1904 machine, which is complete, but somewhat “cosmetically challenged”. 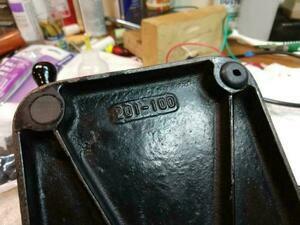 I decided that the correct way to do the parts swap was to abandon the 1904 castings. 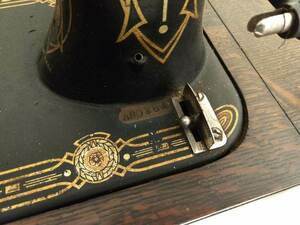 The needlebar lever had an ugly repair made to it, and the decals are mostly gone. 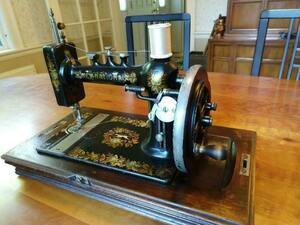 So the “new” 1893 machine got a full complement of fresh parts (only 11 years too new), and now looks pretty good! 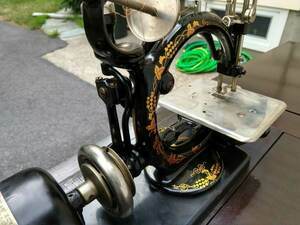 Antique machines look a lot better if you don’t thread them with modern plastic and styrofoam thread spools. 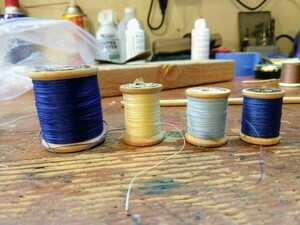 I have a collection of old wooden spools, but some are empty, and those that aren’t mostly have thread that breaks really easily. 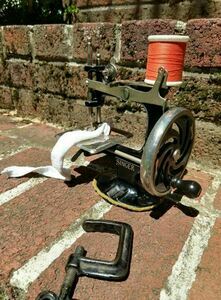 Thread doesn’t always age well, and I think modern thread may just be stronger. Find a length of 1/4” dowel, or similar. I had a couple of pieces of scrap fiberglass rod that I used. 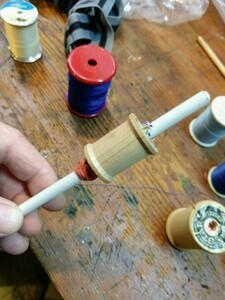 Wrap a rubber band on the other longer piece, in order to form a cushy “stop” for your wooden spool to rest against. 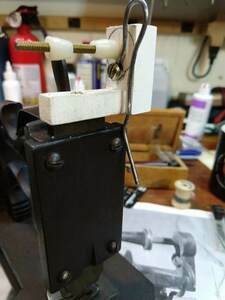 Put the winding piece and spool into the chuck of your drill press. 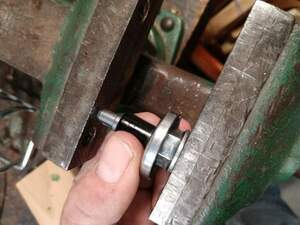 The springiness of the bunched up rubber band gives clamping force, to keep the empty spool from spinning after it is pressed up against the drill chuck. I found that the right speed, for me, was 340 rpm. 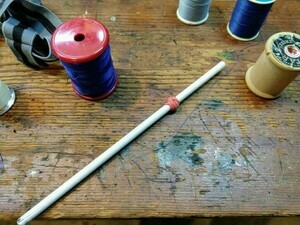 Use another piece of that dowel as a spool holder for the thread source. Wind the spool. Guide the thread with your hand while doing so. 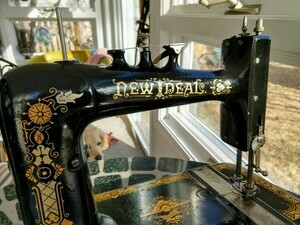 I was seduced by the glittery decals on this little New Home machine when it was listed on Craigslist, and the price was low. So Julia and I took advantage of a sunny winter day to drive down to the Cape to pick it up, and to go for a nice hike. The hike alone was worth the trip. The machine isn’t quite as glittery overall as I’d thought. 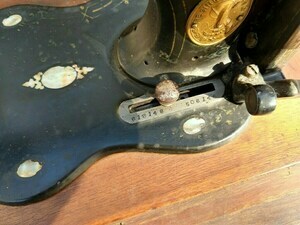 The decals are in good shape, for 1906, but there’s extensive paint chipping along the front of the base, and it was missing the presser foot and stitch length selector knob. It came in a truly junky case, which probably isn’t worth saving. The motor, which I had thought was original, is clearly not. 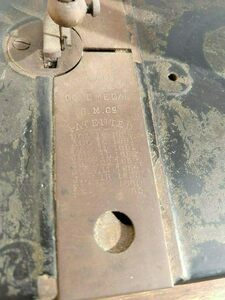 It’s too new to be from 1906, and there’s no motor boss for mounting it – the mounting consists of two #10-24 holes drilled and tapped in the column. Definitely not original. 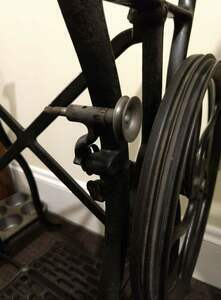 Given the absence of a mount for either a motor or a crank, I assume it was originally on a treadle. 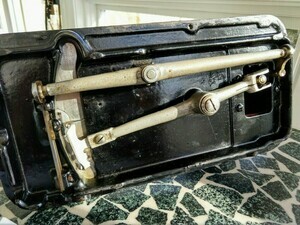 The foot controller seems a lot older than the motor. Perhaps it’s on its second motor, or, more likely, whoever did the conversion to electric grabbed whatever they had on hand. I think they added a lamp, too – there’s a hole drilled and tapped in the middle of the upper arm, just below the “New Ideal” decal, and a bunch of paint is chipped in that area. 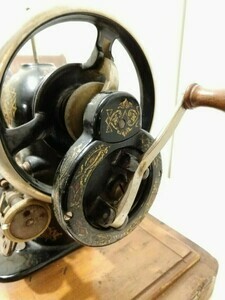 Happily it did have the original shuttle and bobbin, and it stitched nicely on the very first try. I made it a custom base, from the rest of my scrap of butcher block. It works really well for many old machines, which tend to not have much mechanism protruding below the “water line”. 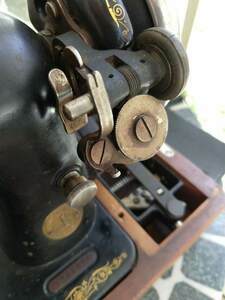 Someone on the Victorian Sweatshop forum had the stitch regulator knob, as well as a few New Home presser feet. Nice improvement! This machine (s/n AD386886) came up for sale nearby, and I realized that if the 101 is anything like the 201 in terms of “personality”, and if it turned out to be a decent machine, I could maybe sell my 201 (in its cabinet), thereby freeing up some floor space. 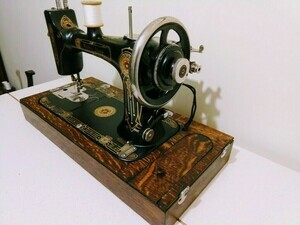 Besides being the first domestic machine Singer ever produced (in 1920) as a dedicated electric machine (it has a potted motor, and no belt groove on the hand wheel), it also had a number of other innovations. The bottom of the machine, instead of being open, for maintenance, is a mostly sealed tub. 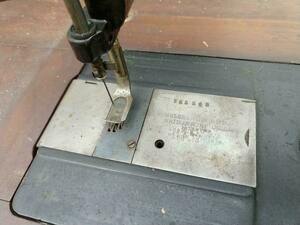 For maintenance, one removes the bed plate. That sounds much harder than simply tipping the machine back, as is done with most other machines. 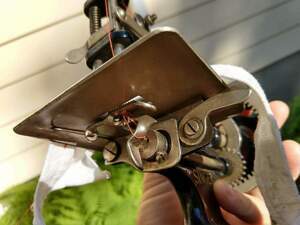 Except that they also simplified the oiling ritual, by implementing a one-stop oiling mechanism – cloth wicks take oil applied to a central oiling hole to all of the pivots one would normally need to lubricate. So there’s one oiling hole in the bed plate for everything underneath, as well as the usual assortment of oil holes on the upper parts of the head. The 101 mostly freed up with liberal doses of fresh oil. It still felt a little stiff, so I switched to penetrating oil… which didn’t help. 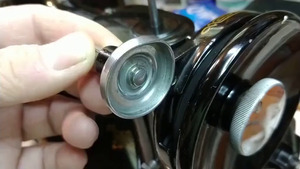 In the end it turned out that someone had incorrectly installed the small stack of washers that act as “clutch plates” when locking and unlocking the hand wheel with the stop motion screw. 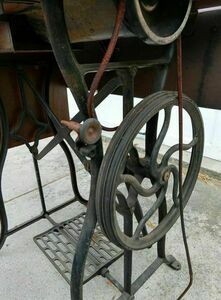 With that stack backwards, the hand wheel would drag on the body of the machine when the stop motion wheel was tightened. 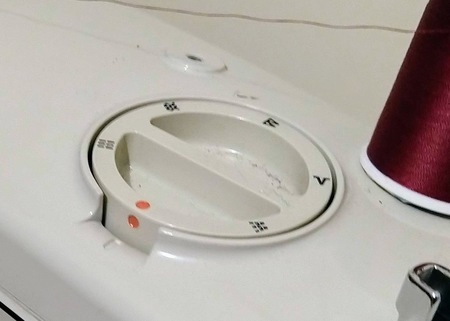 Happily, a copy of the adjuster’s manual explains exactly how to get those washer right. 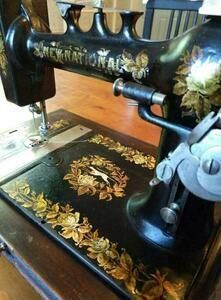 After a bit more cleanup, the machine is sewing perfectly. I just need to make a display base for it now. 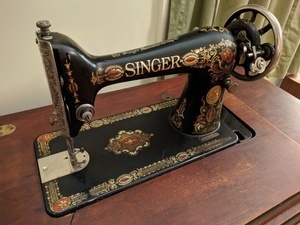 This 1906 model 15 (s/n H906147) came to me from my brother-in-law, who rescued it from a scrap metal recycling drop-off near his home in New Jersey. (Thanks Scott!) Considering where he found it, it’s in decent shape. 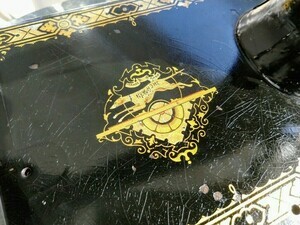 The Tiffany/Gingerbread decals are faded, but still have some of their iridescence, and while it’s all a bit rusty, I’ve seen far worse. 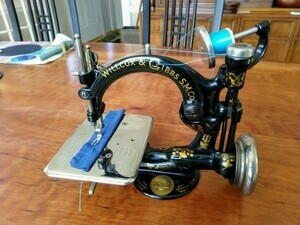 It’s missing its bobbin plate and bobbin case, but otherwise looks complete. It’s stiff, but it does turn over. Well, that was quick! The first picture, above, was taken post-cleanup. A little oil in all the right places, and let it sit for a couple of days, moving the hand wheel once in a while, and it now stitches just fine. 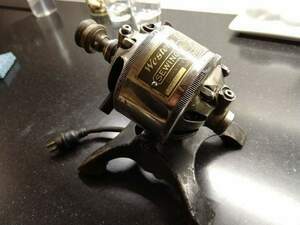 It’s missing its bobbin case, which is a crucial part of course, but it turns out that the model 15 and its clones were so popular that the class 15 bobbin case was used by Singer, and other makes (Necchi, for example) all the way into the 1980s. 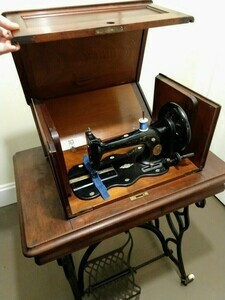 So I was able to borrow the bobbin case from my mother’s FashionMate 237, and it fit perfectly. 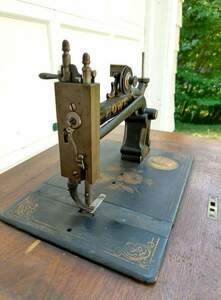 This machine was made by the Gold Medal Sewing Machine Co., of Orange, MA, which was a predecessor to the New Home company. 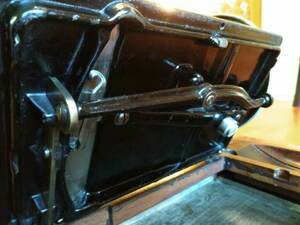 The last patent date on the shuttle slider is 1865, and from what I’ve read so far, it seems to have been made sometime between 1870, when Stephen French designed it, and 1877, when all of the “Combination” patents had expired, and the New Home machine was developed. It’s dirty and a bit rusty, but it turns over, and the shuttle is present. 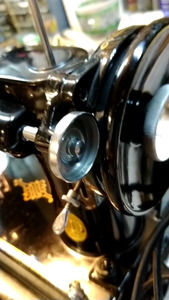 The serial number is stamped on a small disk which sits at the base of the spool pin: 71219. 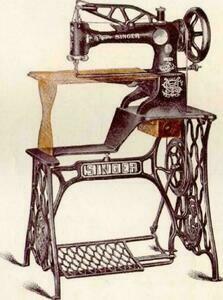 I’d love to think this means it was the 219th machine made in 1871, but there’s no basis for that, of course. I don’t even know if that style of numbering had been created yet. 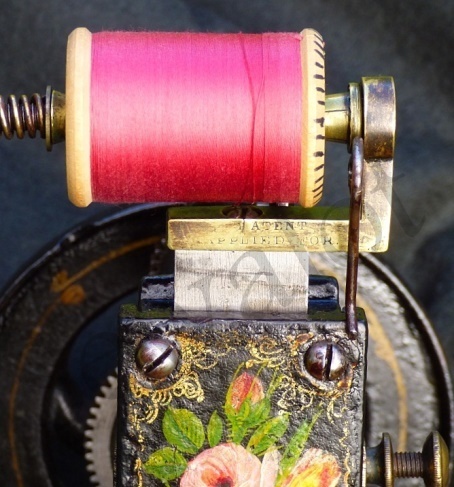 There’s just barely a vestige of a floral painting on the faceplate, and there’s a just a bit left of a painting on the bed as well – it might be picture of the factory, but there’s too little remaining to be sure. 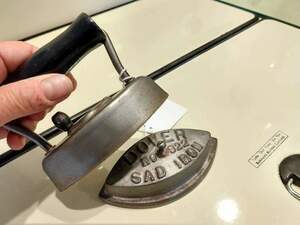 The machine was clearly made by Gold Medal – it’s stamped right into the slider – but at least some advertising shows it as being made by Johnson, Clark, & Co., which was a previous incarnation of the same company. Anyway, I’m looking forward to getting it cleaned up. I think it came out well, and there’s more of the decorative painting left than I’d realized. Some random detail shots, taken during the cleaning process. Mostly they were to remind me how things would go back together, so they’re all “still dirty” shots. And here are some before/after comparison shots. I rarely think to do these, but I should – even I tend to forget how dirty these machines sometimes are when I get them. Of course the decals are all a bit faded, but they’re still very pretty, and none are completely worn off. 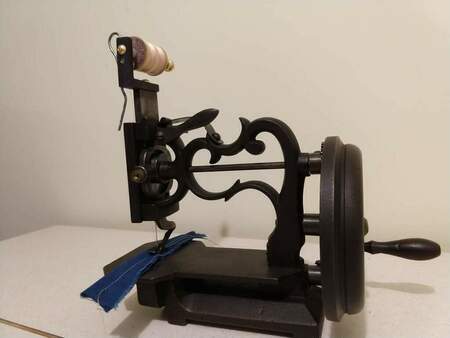 I wonder who wound this bobbin, and when? 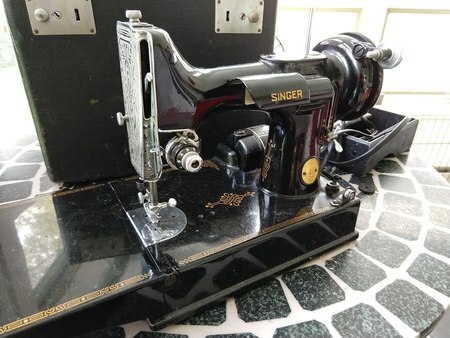 Interestingly, Singer actually seems to have called this machine the “V.S. 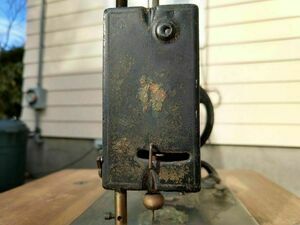 Hand Machine”, and only used “V.S. 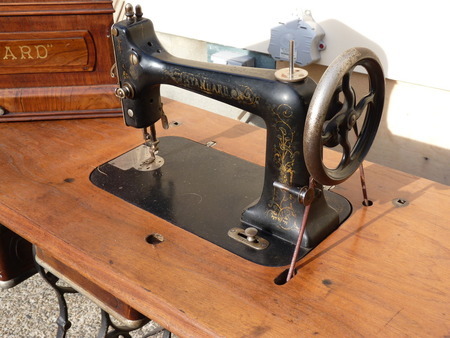 No.3” for the treadle version. 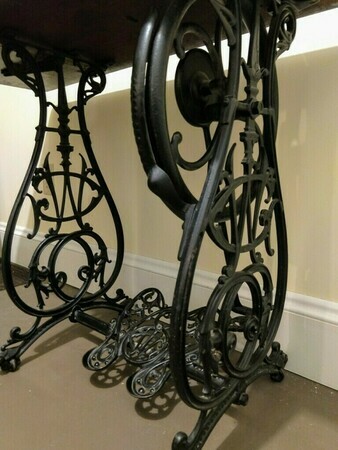 The two do have different castings – the treadle would not have been cast with the protrusion from the side of the pillar to which the hand crank mechanism is attached. 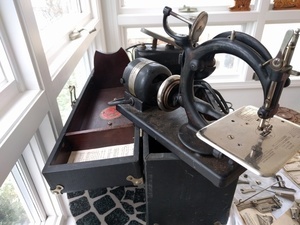 I’ve made plans to take my W&G hand crank machine with us in our van on our next longish vacation, in case I get bored and want to make something. 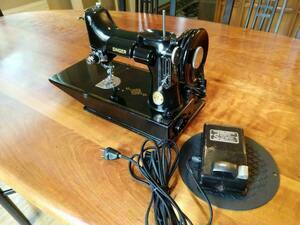 Sewing sometimes involves ironing, so I decided I needed an “off grid” iron. 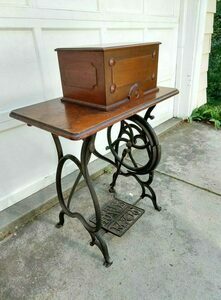 And this appeared at a local estate sale. Even if I never use it, I’ll chuckle at the notion of taking an iron on a camping trip! It’s only about 5” long, and has a detachable handle and heat shield. 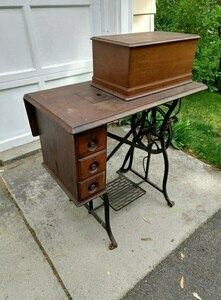 I don’t really know when it was made – probably in the 1920s or 30s? 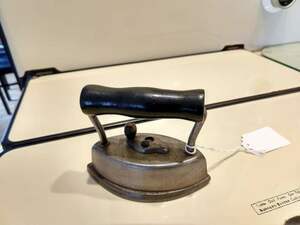 An iron this size would have been for collars, lace, etc. Not bed sheets! 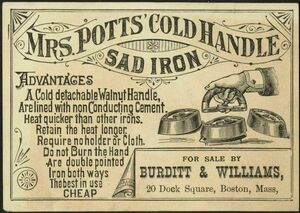 The name “sad iron” (or “sadiron”) apparently comes from an archaic use of “sad”, which meant “solid”. 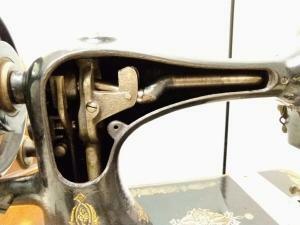 The detachable handle was patented in 1871 by an inventor (she called herself an “inventress”) from Iowa named Mary Potts. 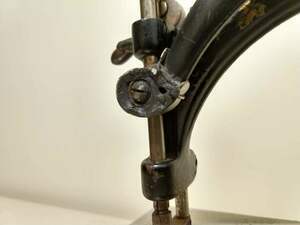 The removeable handle meant that the handle remained cool while the base was heating on the stove. Staying cool also meant the handles could be made of more varied materials than before (like wood), since they stay near hot stove. She also patented a new construction for the base itself. 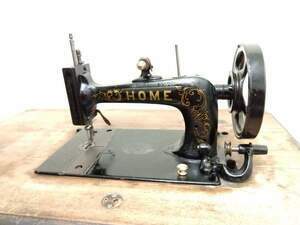 Rather than making it from solid iron, which led to a heavy, very hot iron, she made the base hollow, and filled it with a heat insulator like cement or clay. This caused more heat to be directed downward, away from the user’s hand. Finally, her irons were double-pointed, and could be used in either orientation. 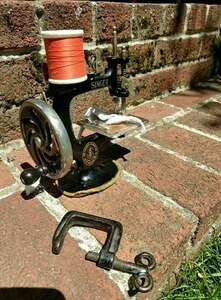 Sometimes one of the ends of a long bobbin comes loose. 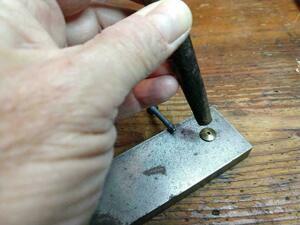 The brass ends are simply press-fit onto the shaft. Glue might work to keep the end in place, but since it wasn’t glued to begin with I’d personally prefer to fix it without. 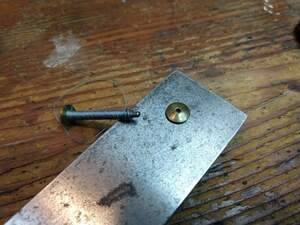 I took the loose brass end, and set it on a solid chunk of steel that wasn’t going to move when I hit it. 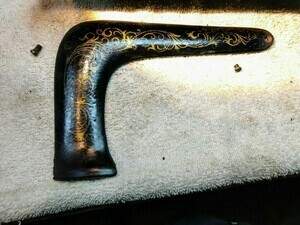 I set the brass piece down curved side up. 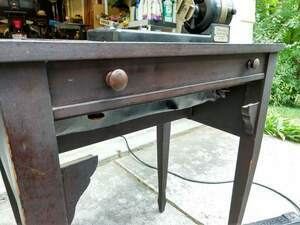 I happen to have a nice heavy piece of smooth steel bar handy at my workbench, but the flat end of my vise, or an anvil, or really anything solid would do. A concrete floor would probably work, but you don’t want to damage the brass end against it. Smooth steel seems best, to me. 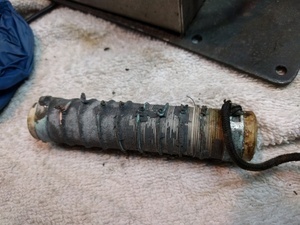 Sure enough, after smacking the brass piece just once between the drift and the steel slab, it no longer fit easily onto the shaft – I could press it on just a bit by hand, but it jammed up nicely very quickly and wouldn’t go further. 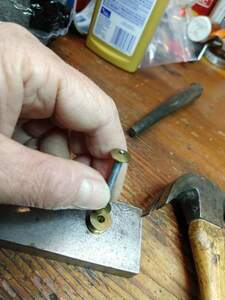 So, to get the brass end the rest of the way on: I rummaged in my junk box(es) and found a thick brass washer , with a hole larger than the bobbin shaft but quite a bit smaller than the brass bobbin end. 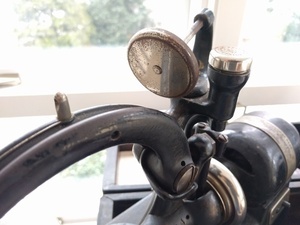 The washer was thicker than the eventual protrusion of the bobbin shaft from the bobbin end – a brass nut would have worked as well, and been easier to find. 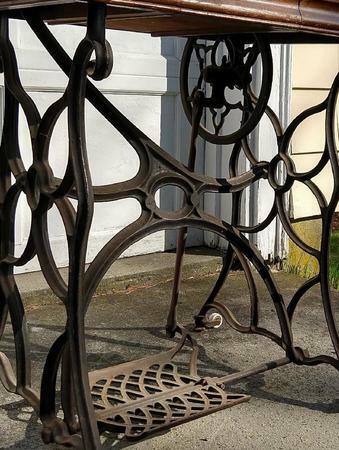 Lots of things would work – basically any piece of steel or brass with a hole in it. 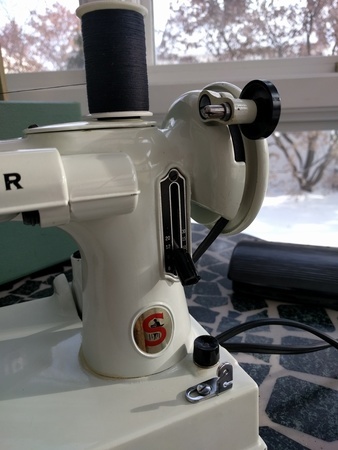 I centered the bobbin end (the one I just partially pressed on) on the hole in my washer, and used my small hammer to tap on the other end of the shaft to drive the shaft through the too-tight bobbin end. 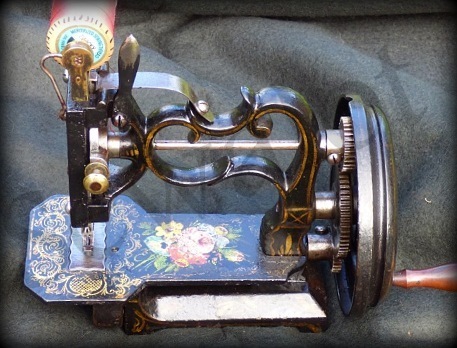 I was careful not to go too far – I went just far enough to make the two ends of the bobbin symmetric. It only took a few taps of the hammer. I live near Boston, so I get out to central Massachusetts fairly often. 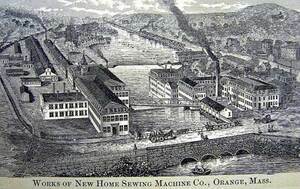 One day, while en route home from a hike, I realized we were quite close to Orange, the town where the Johnson, Clark & Co. sewing machine companies all came from: Gold Medal, Home, and New Home. 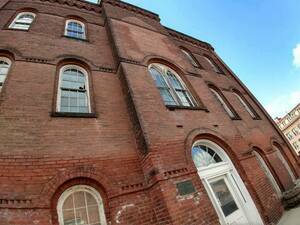 And I’d read that the original buildings were still there. So we made a short detour, and I took a few photos. Those pics are all of the same building featured in the foreground of these renditions of the New Home complex, some of which I downloaded from a local museum dedicated to industry in the area, and the other two came from needlebar.org. 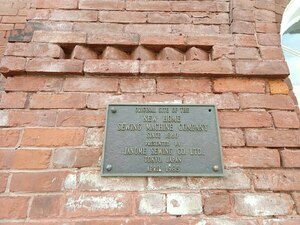 I just love that the building is still there. 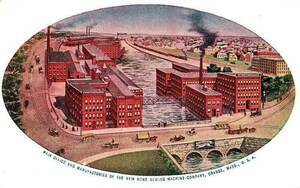 It’s entirely possible that my Home machine was made right there in the early to mid 1870s. Interesting that the facade of the building I photographed is rendered slightly differently in all three of these images! 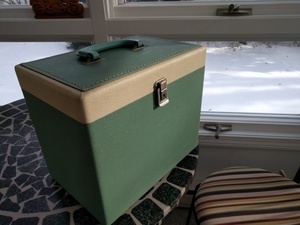 I already own a 15-30 head with Tiffany/Gingerbread decals – one of my brothers-in-law rescued it from the scrap metal recycling pile at the DPW in the town where he works. 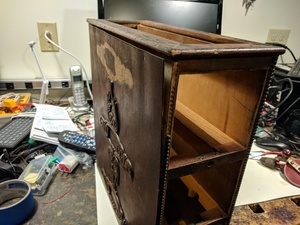 It’s in surprisingly good shape, given that history, but it has a fair number of scratches, the decals are worn and have lost most of their color accents. 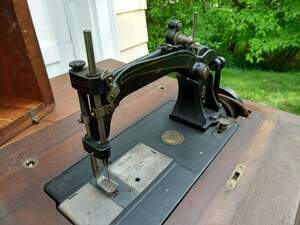 And because it’s from 1906, it has no motor boss, making it difficult to make it sew, since I’m unable to give it a treadle. 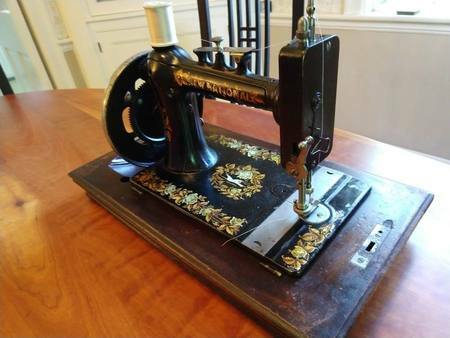 So I took notice when this 1921 portable showed up on FB Marketplace. 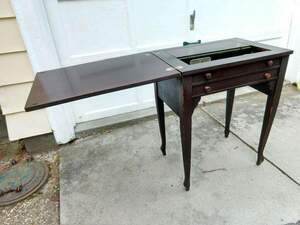 They wanted $25, and it looked to be in really good shape. An hour before I was going to go pick it up, they called and apologized profusely that they’d dropped it! It seems the case hadn’t been latched properly, and they claimed that it was now “garbage”. 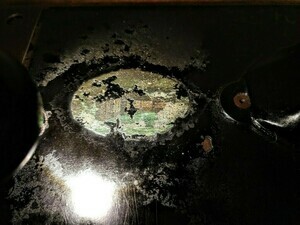 I was skeptical, and asked what was damaged, and they said I could have it for free if I was still interested. So I drove over and walked right out with it, without even opening the case. 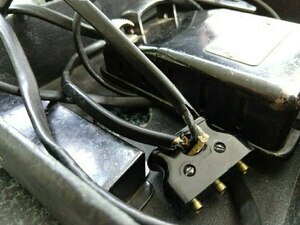 Sure enough: the base of the case was broken a bit, the foot controller had popped open (but no parts were lost), and the light had come loose, but it tightened back up. There was no damage done to the paint or decals that I could find. Did I mention that all it needed was some thread and oil to start sewing perfectly? And it was free!